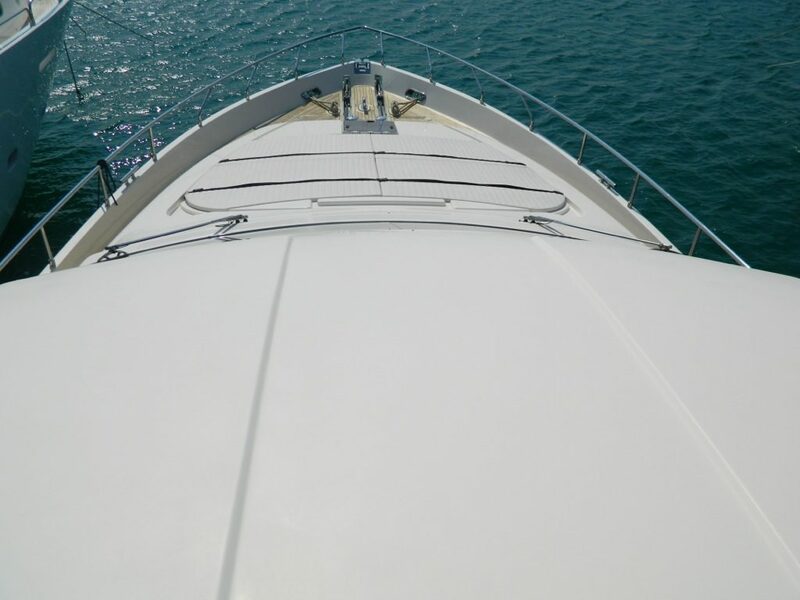 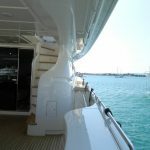 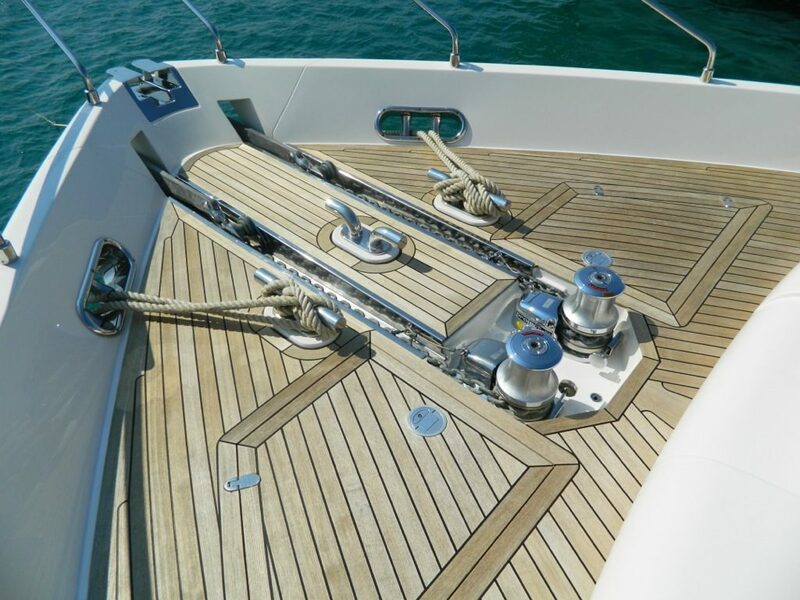 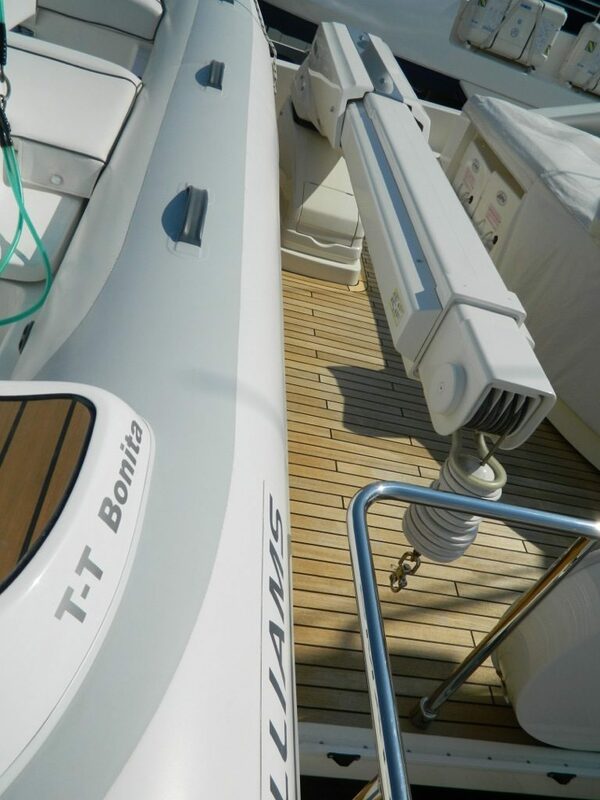 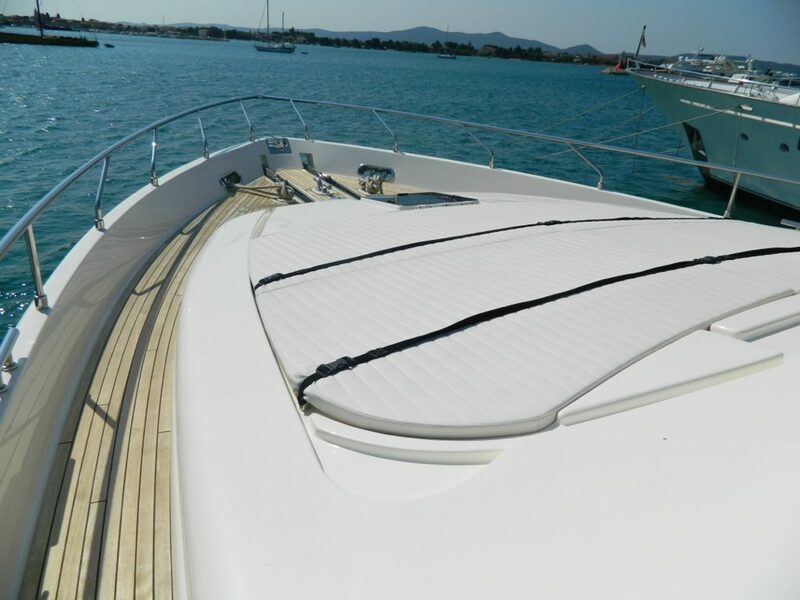 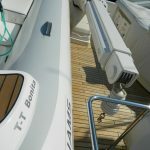 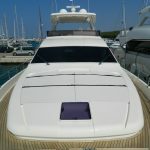 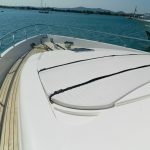 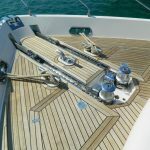 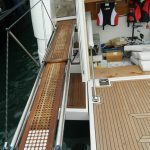 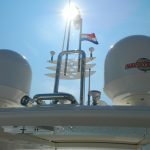 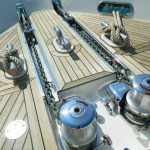 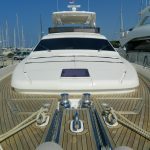 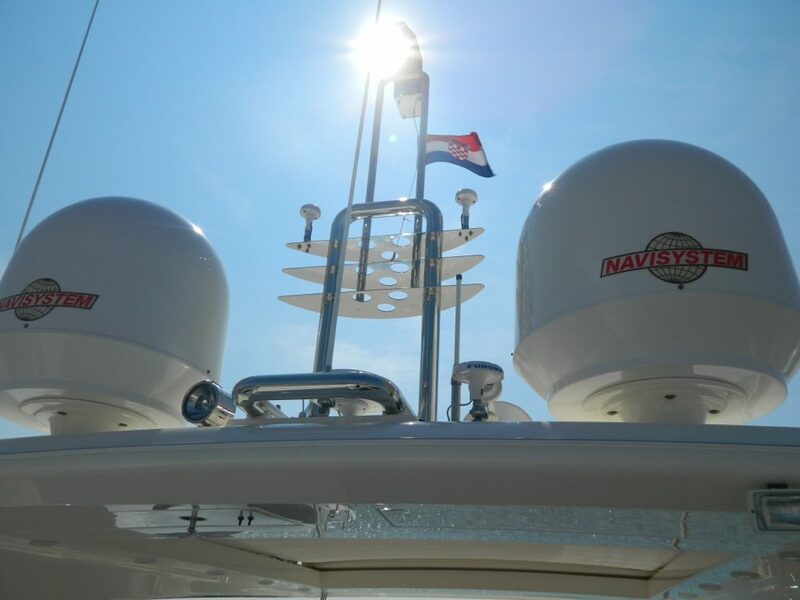 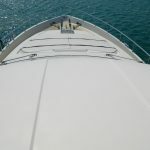 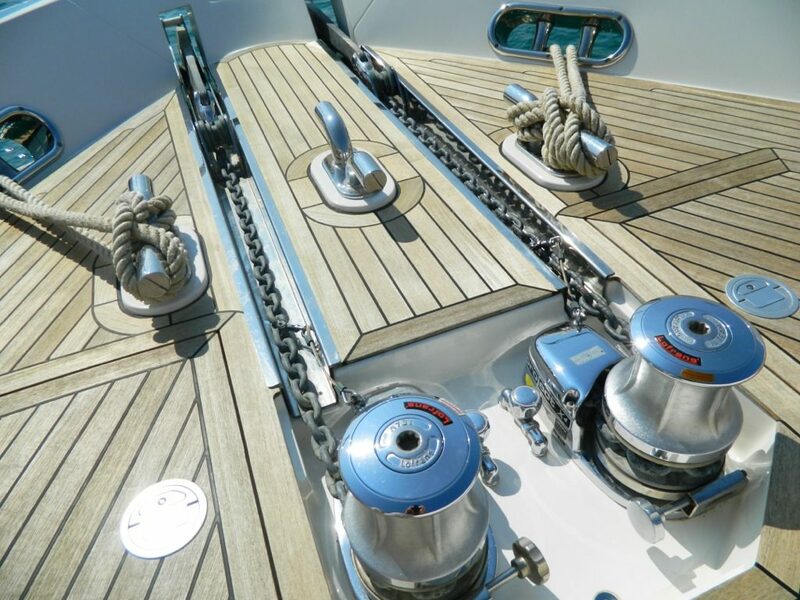 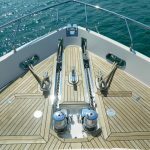 The slender lines of the flying bridge are due to the roll bars’ unusual position toward the bow. 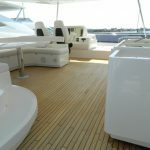 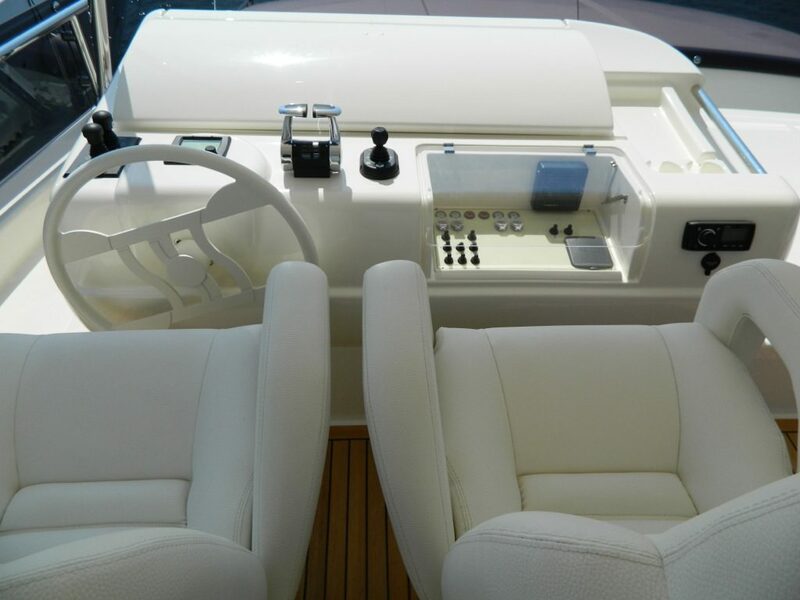 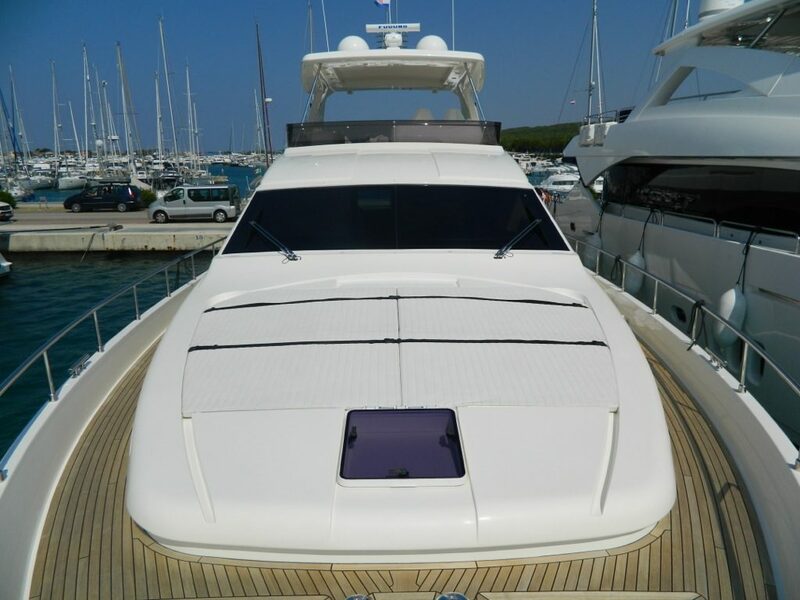 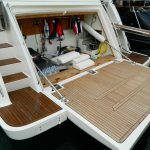 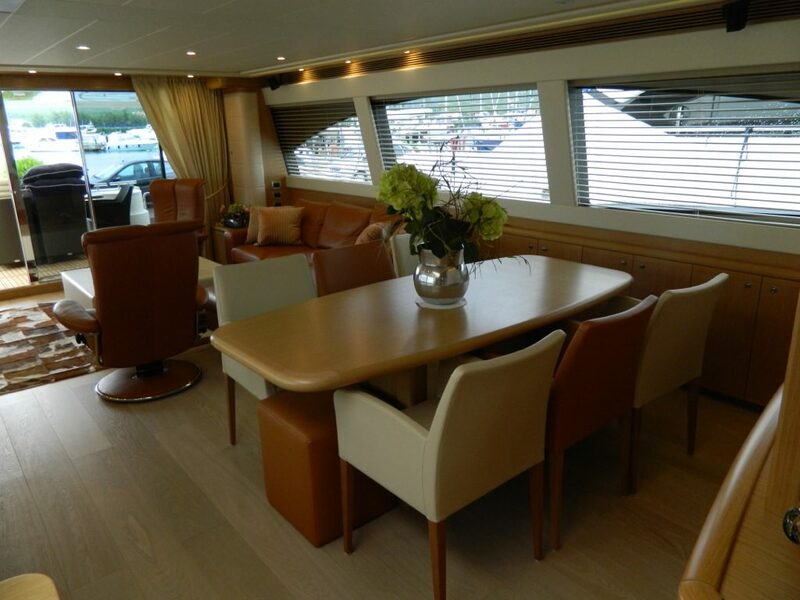 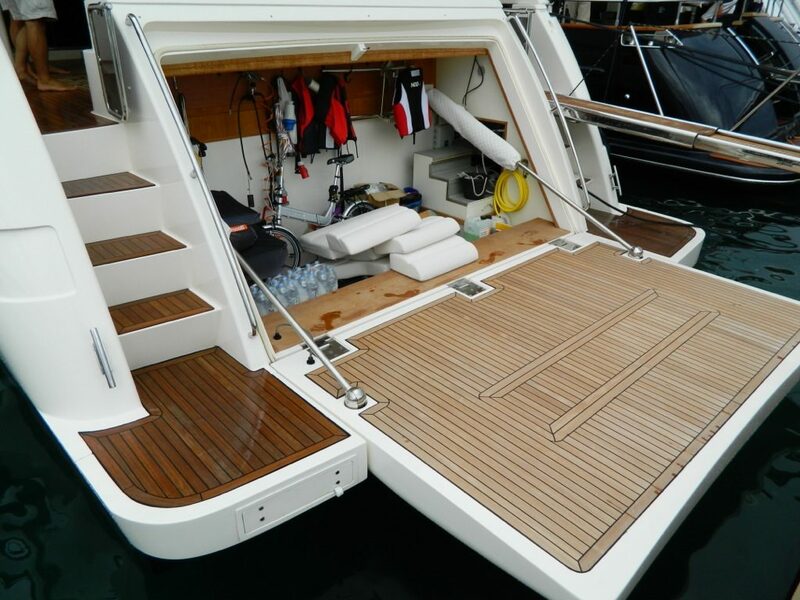 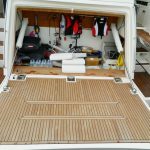 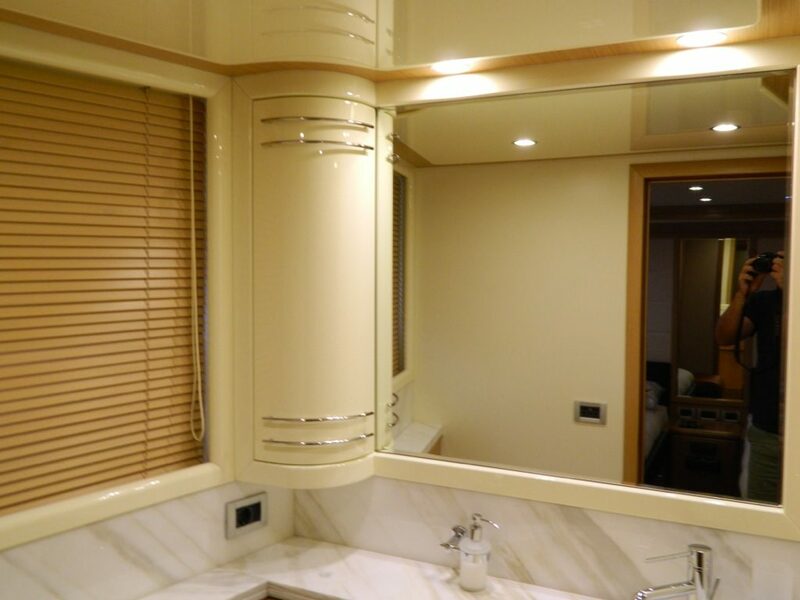 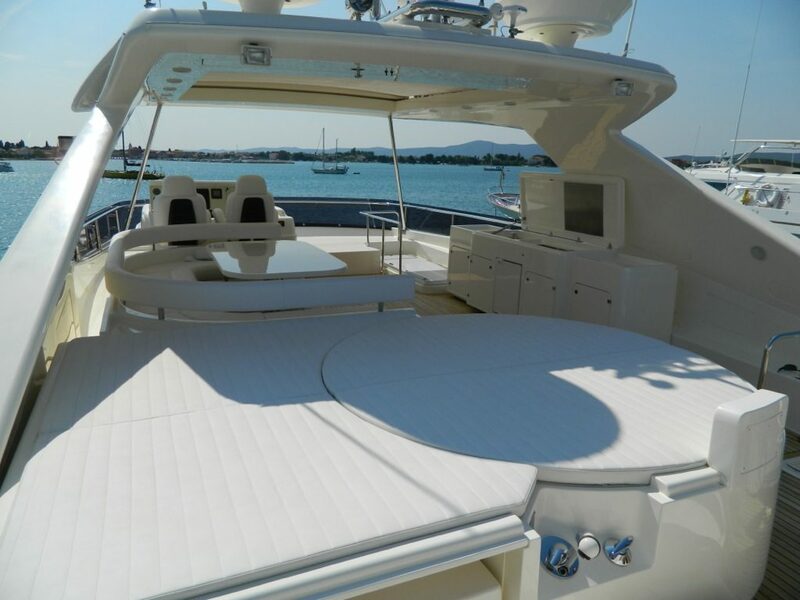 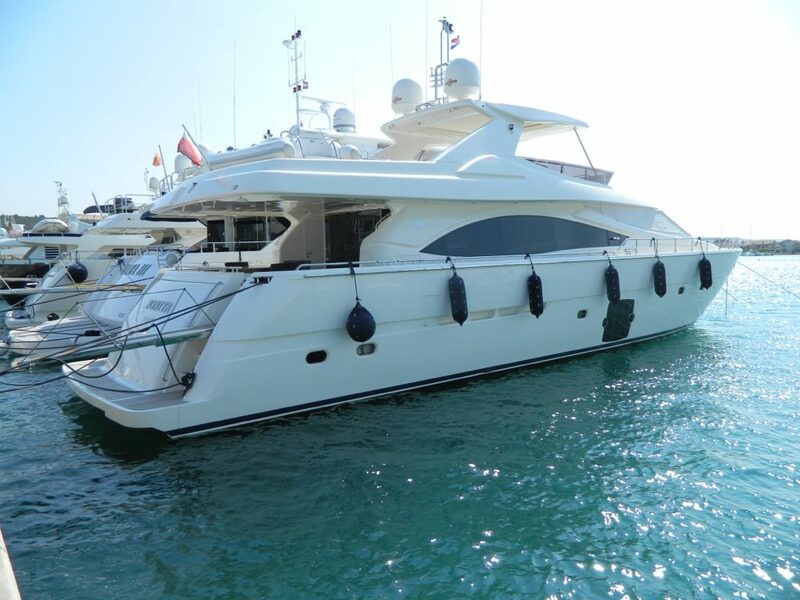 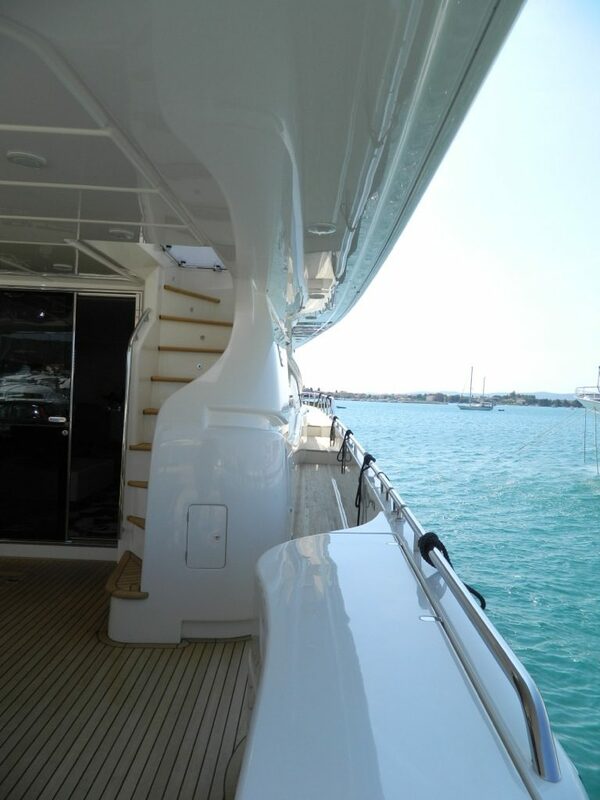 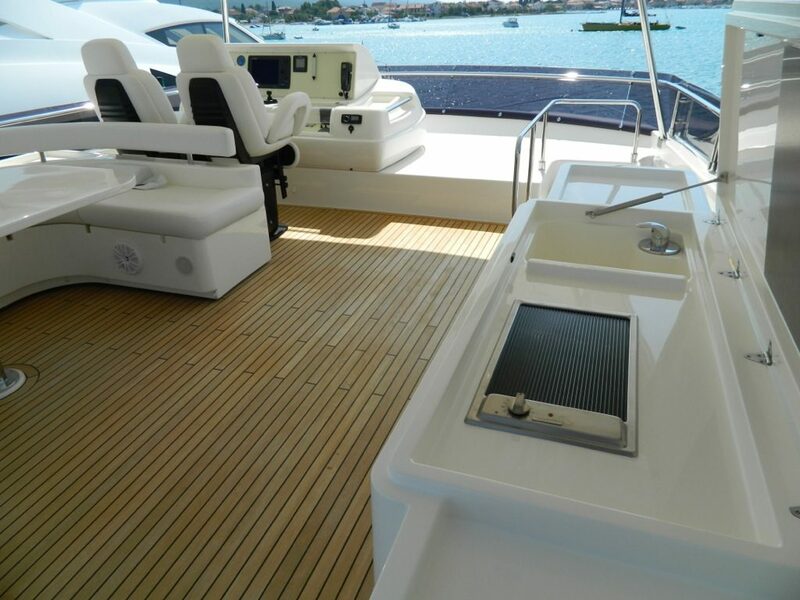 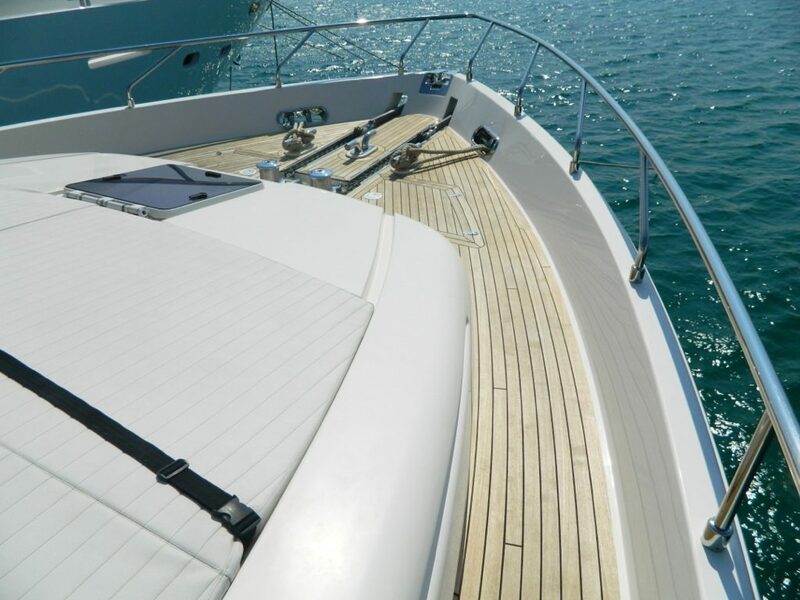 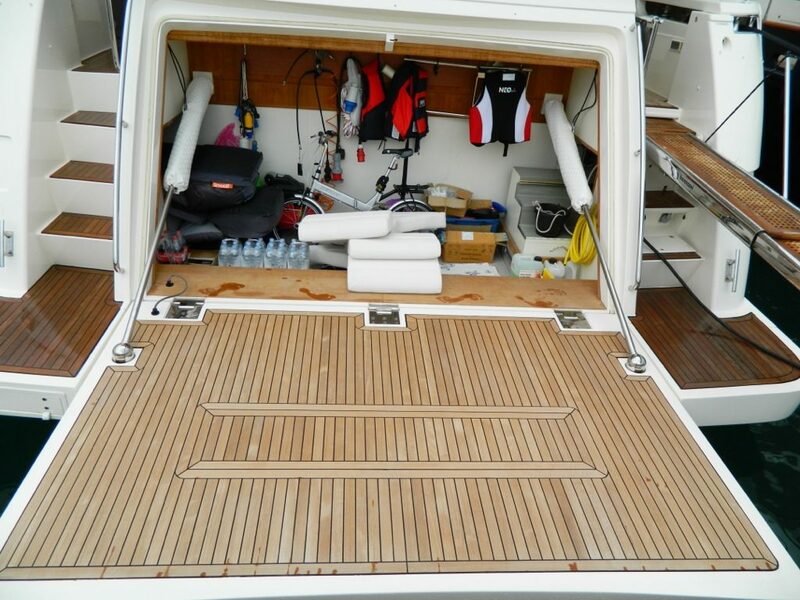 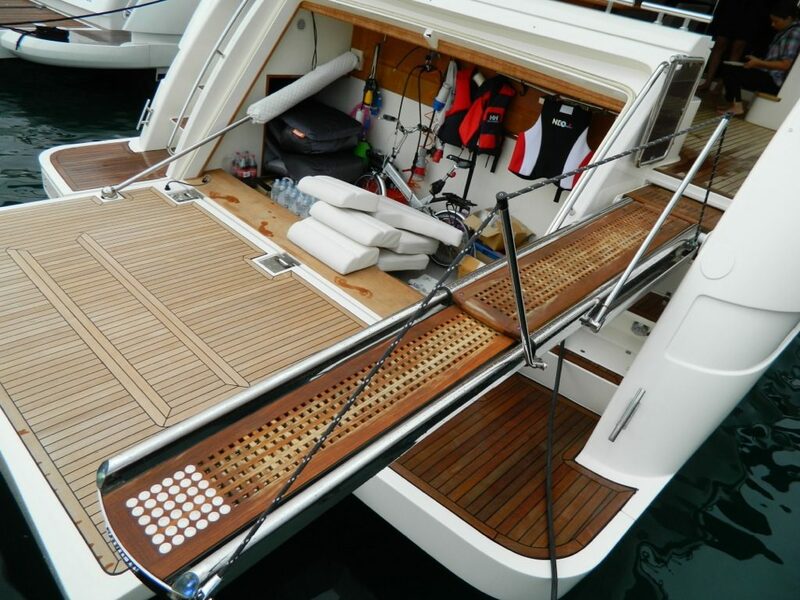 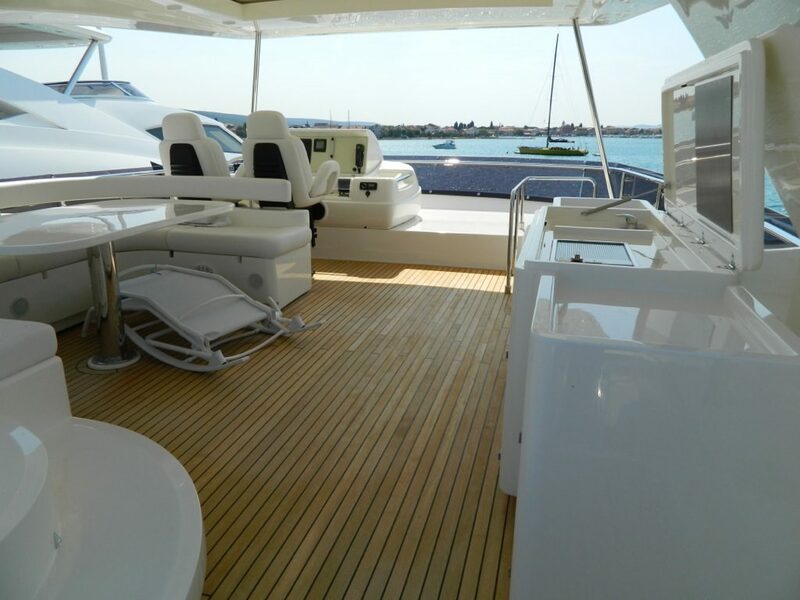 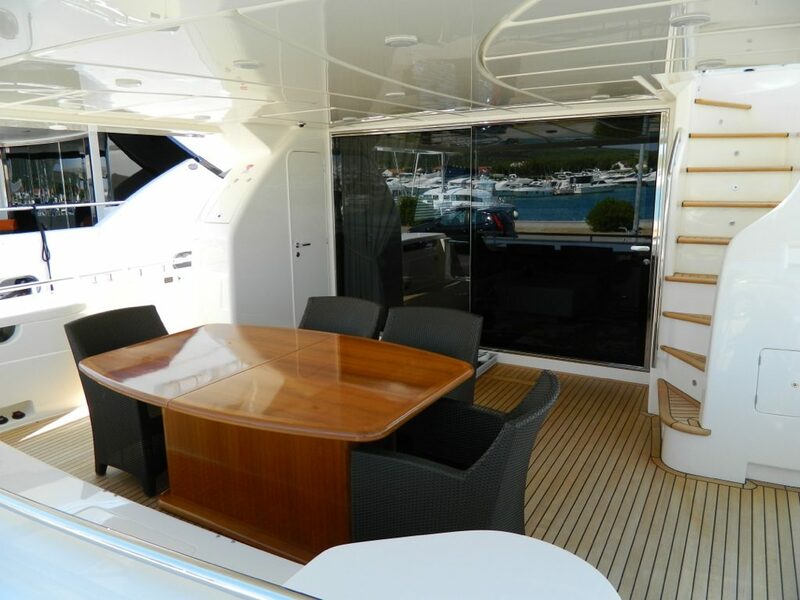 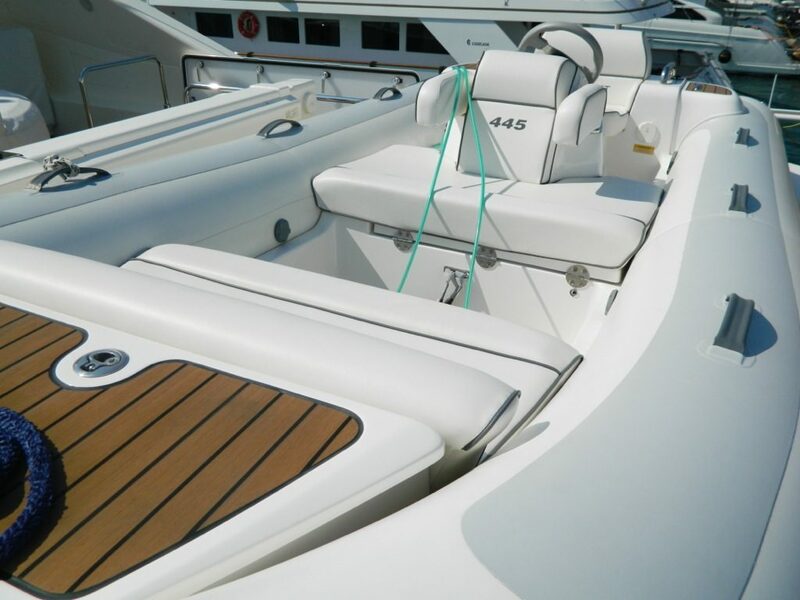 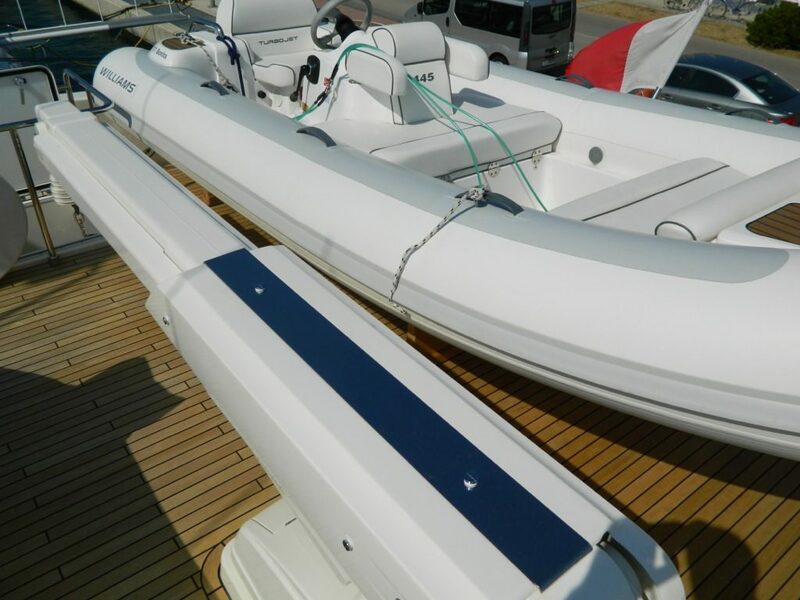 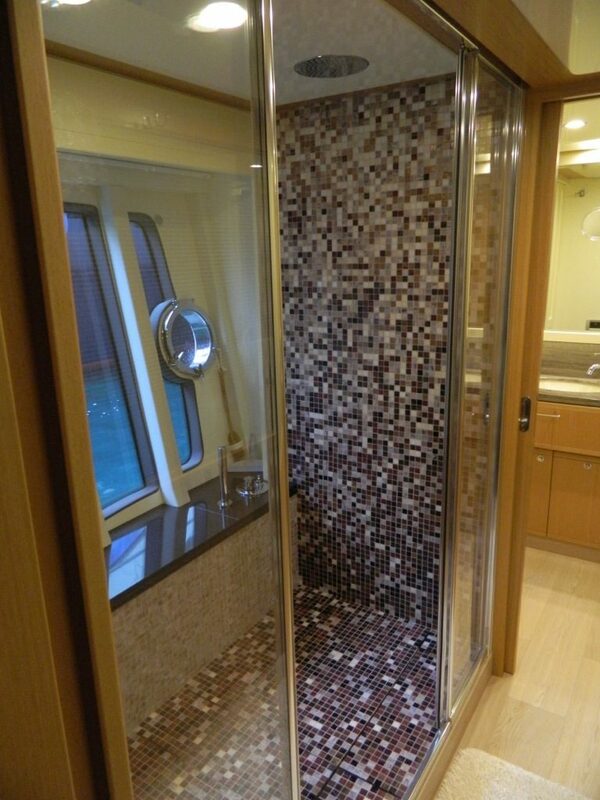 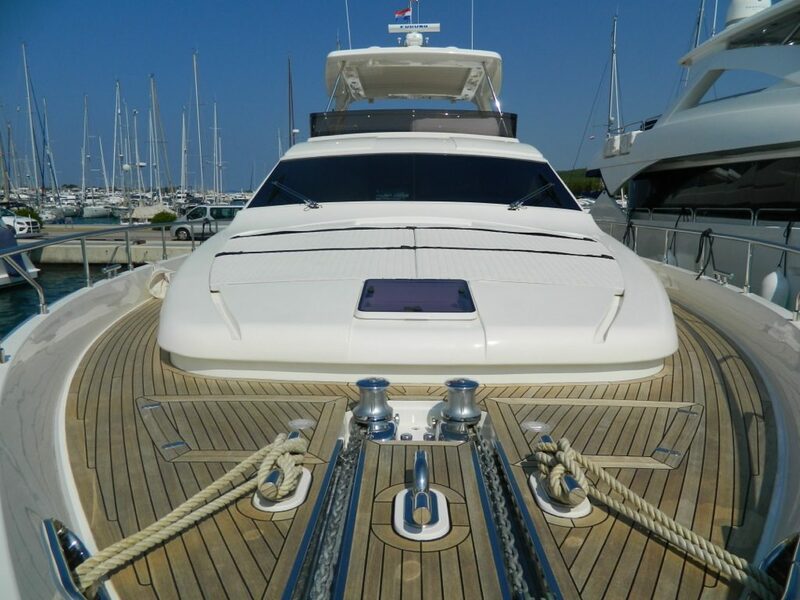 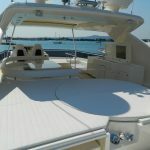 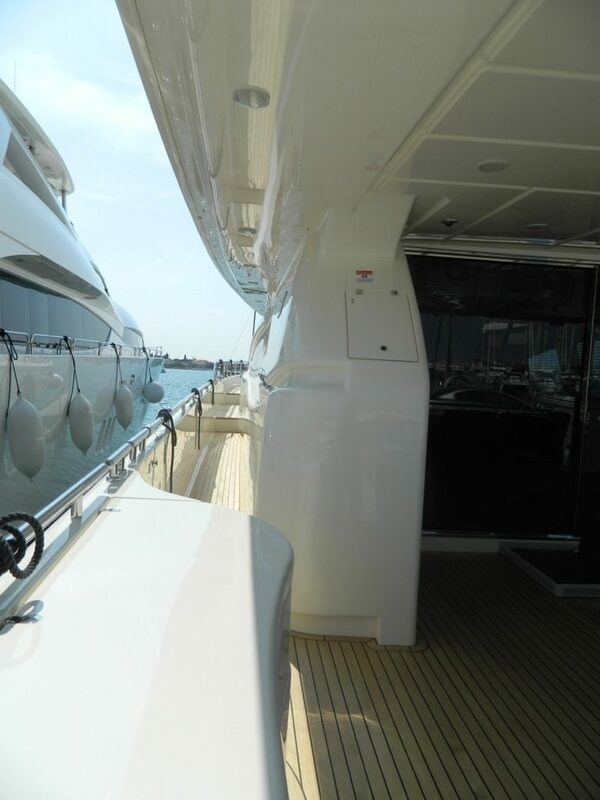 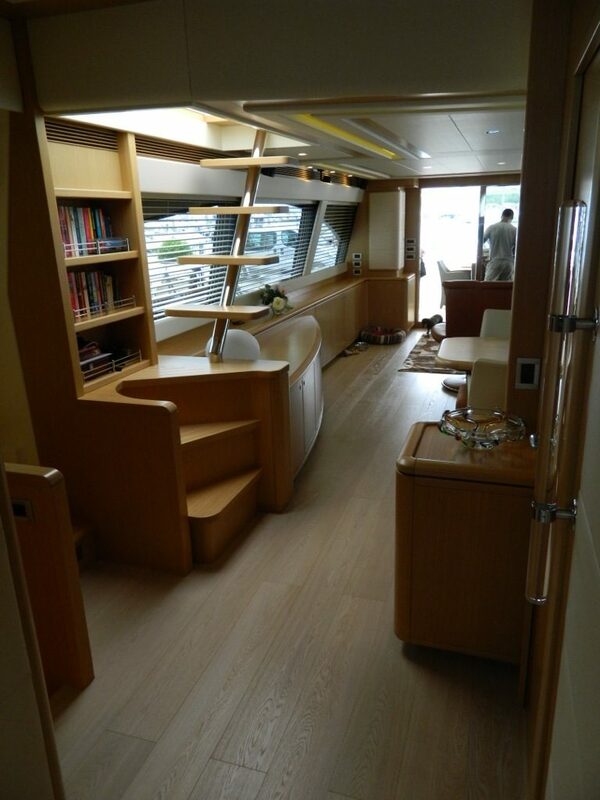 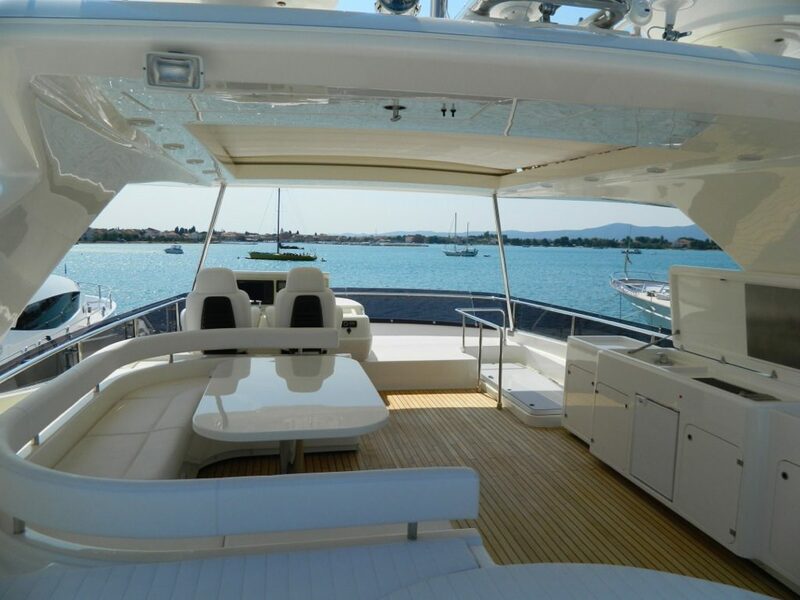 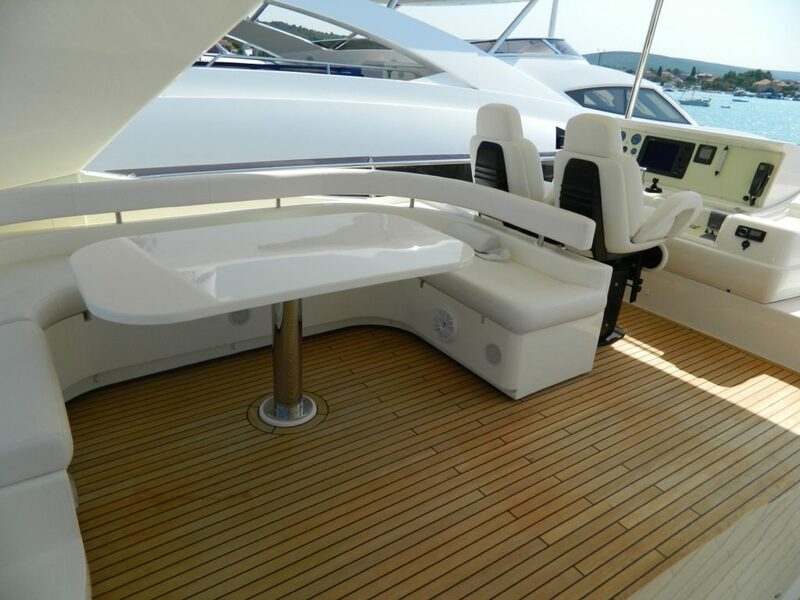 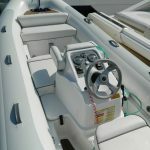 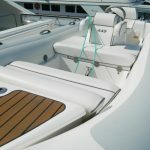 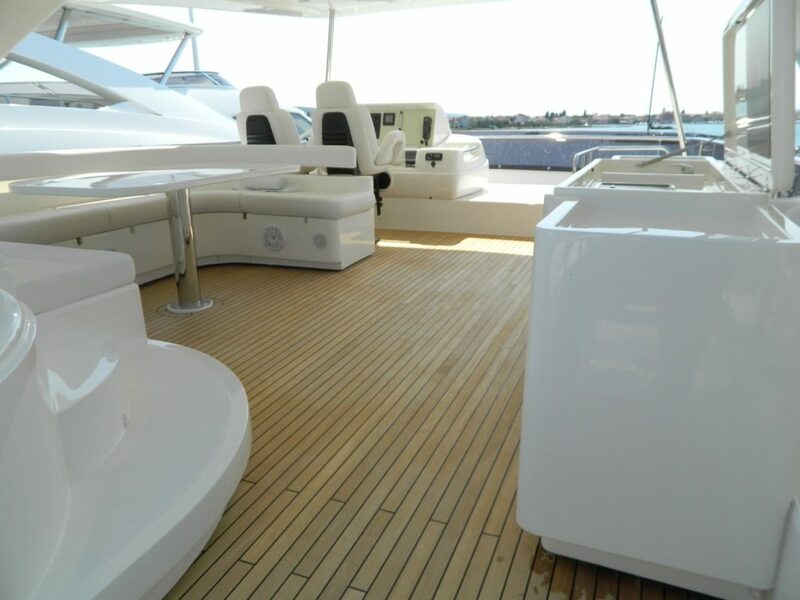 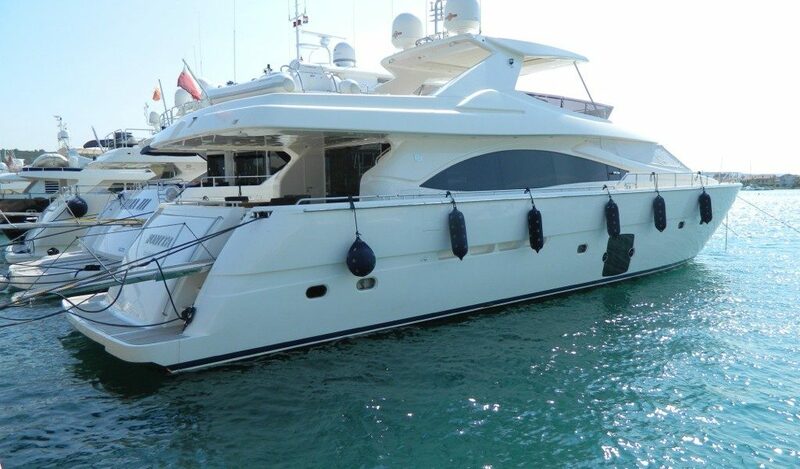 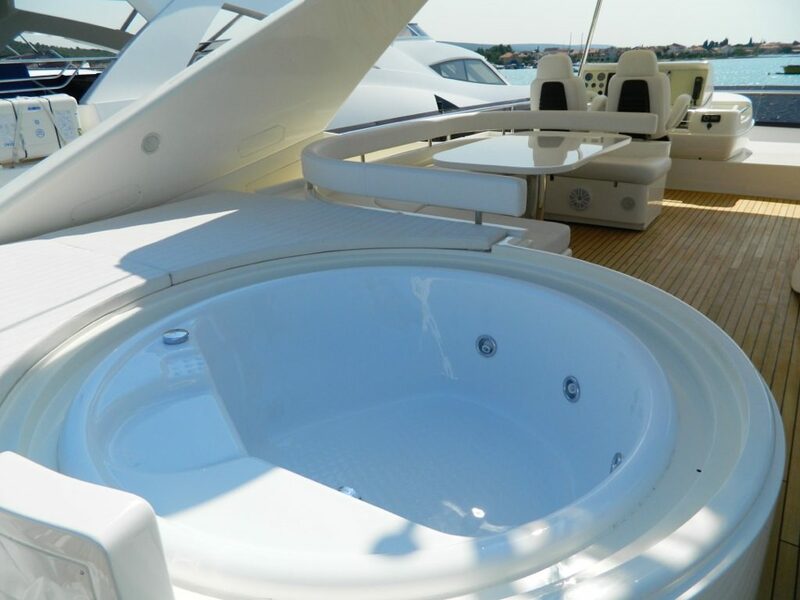 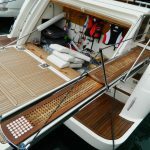 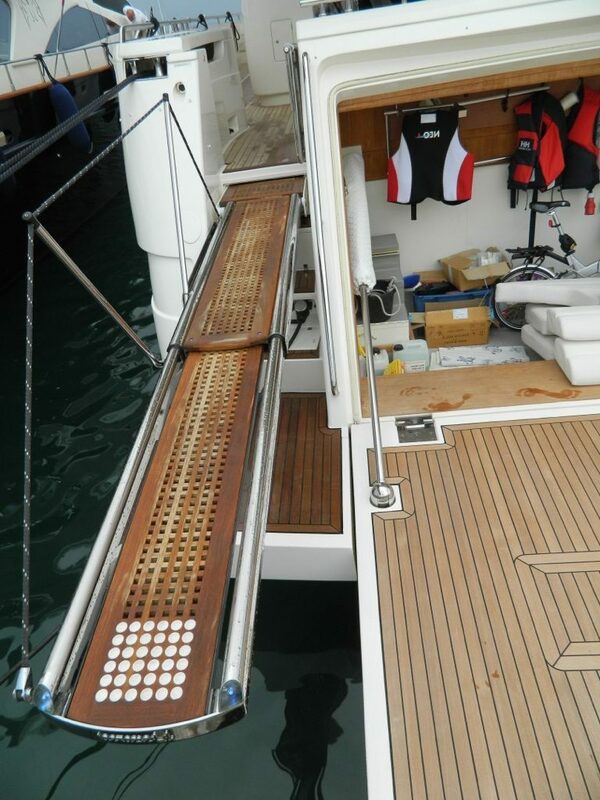 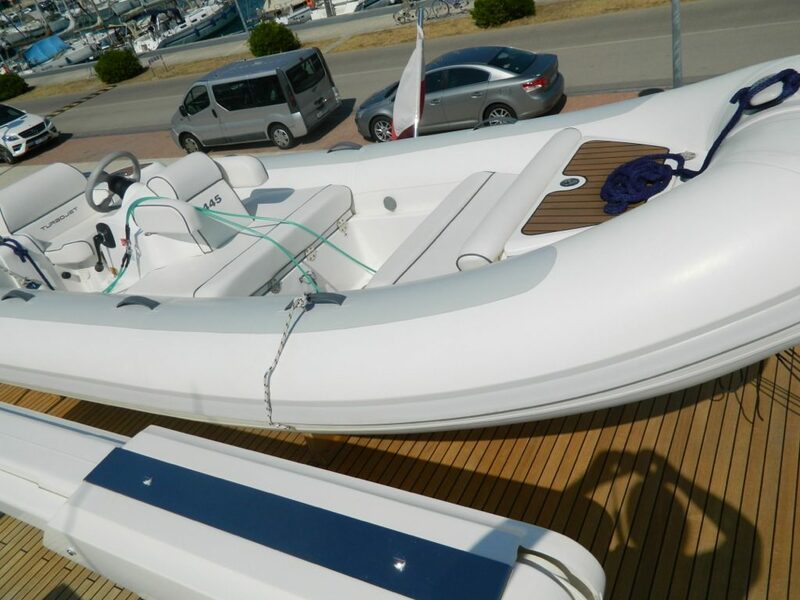 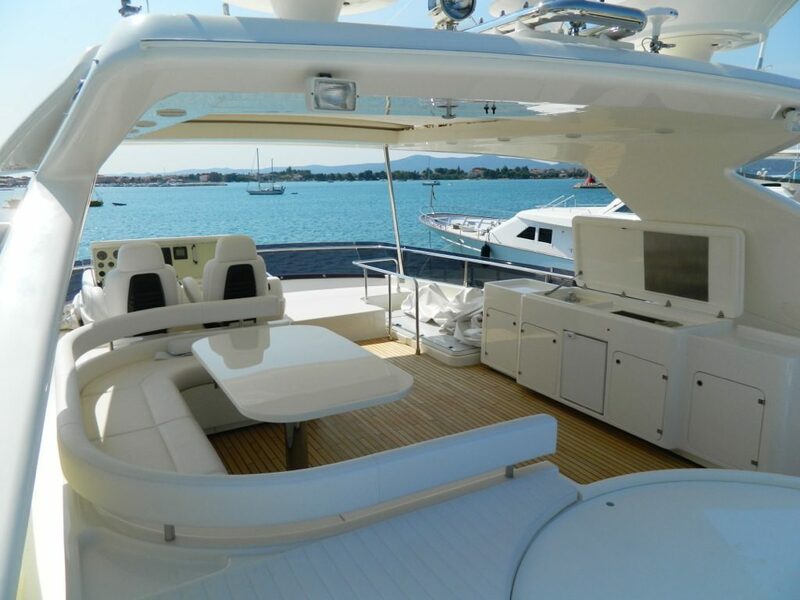 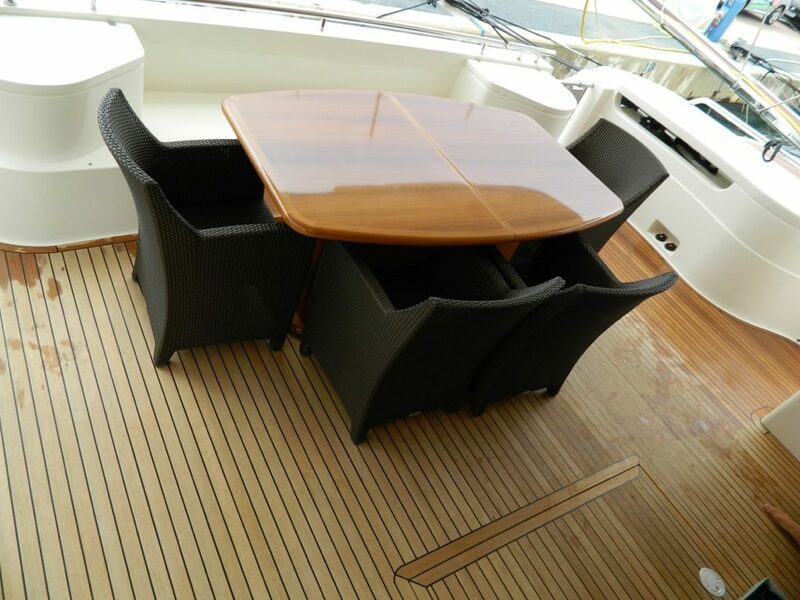 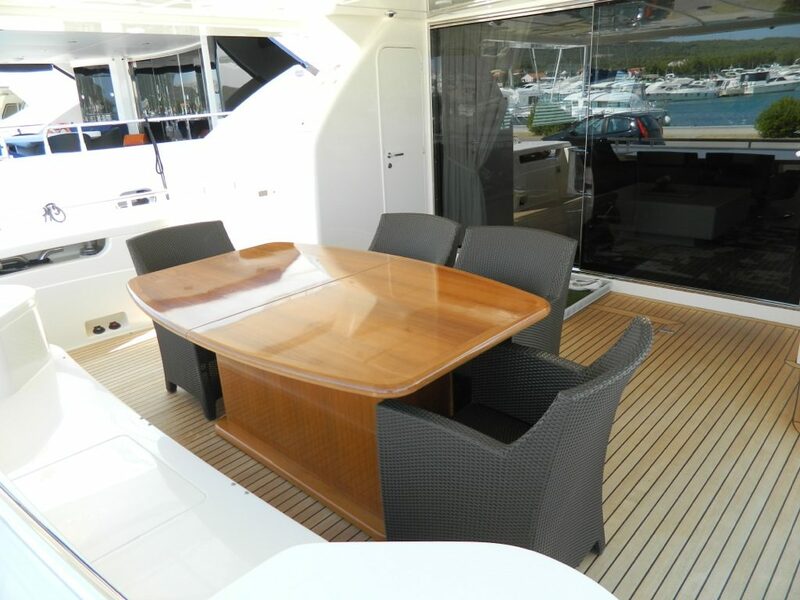 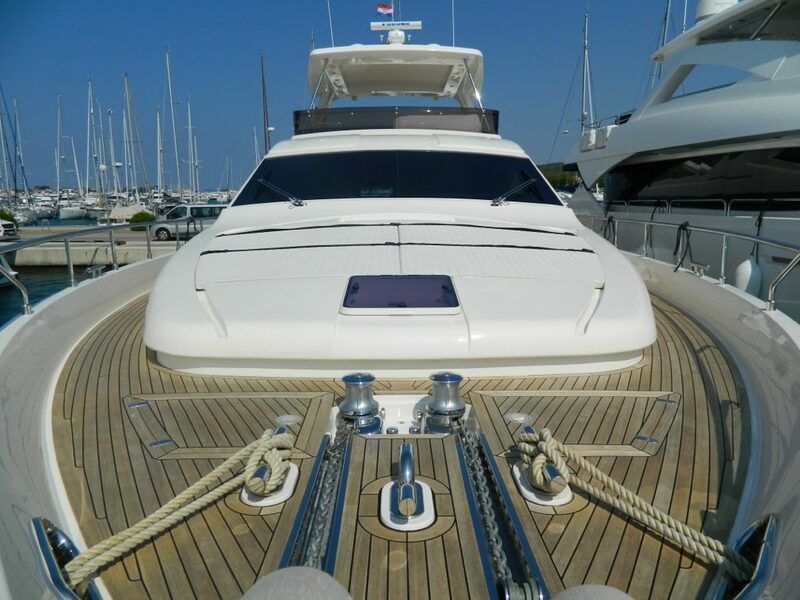 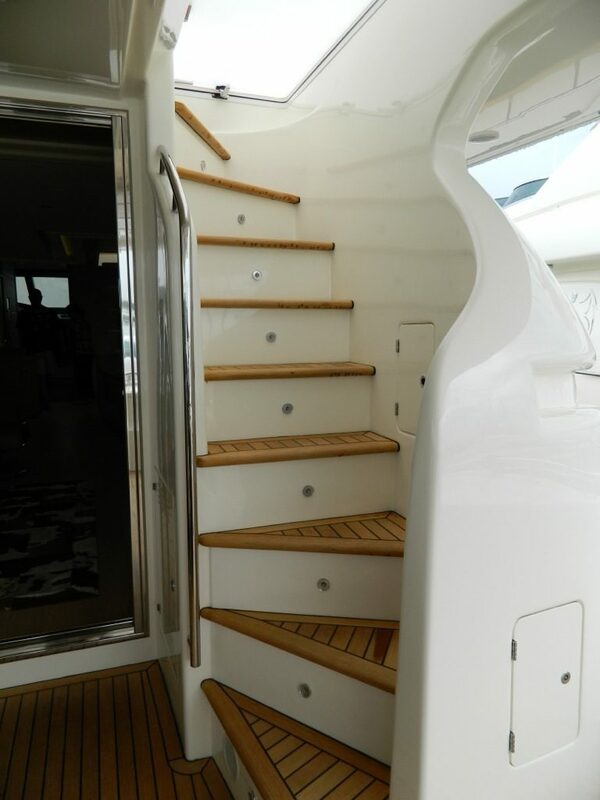 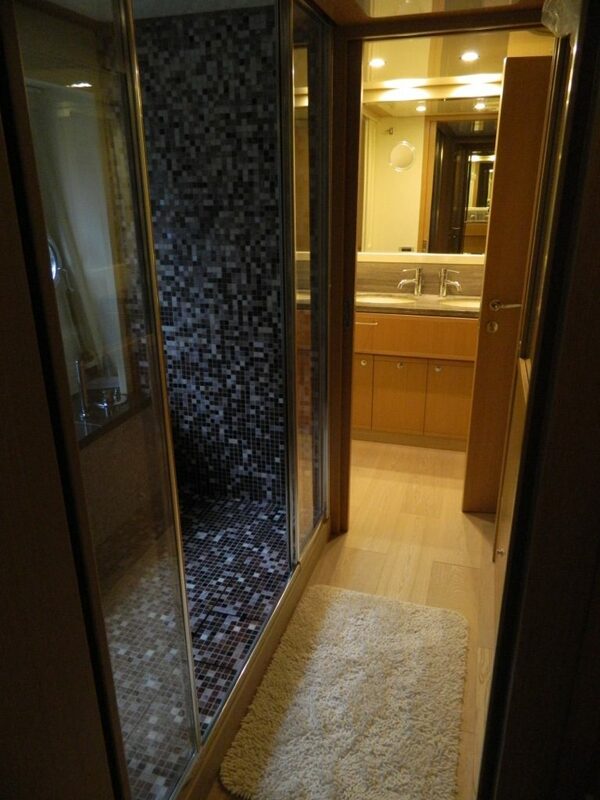 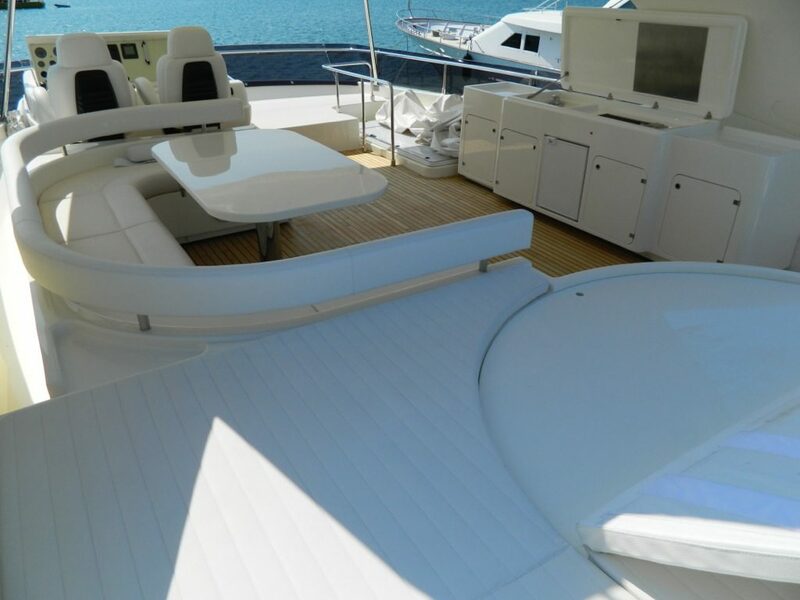 Ferretti is varnished with valuable coatings of cherry gloss and highly accurate finishings. 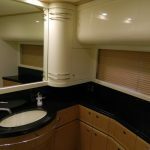 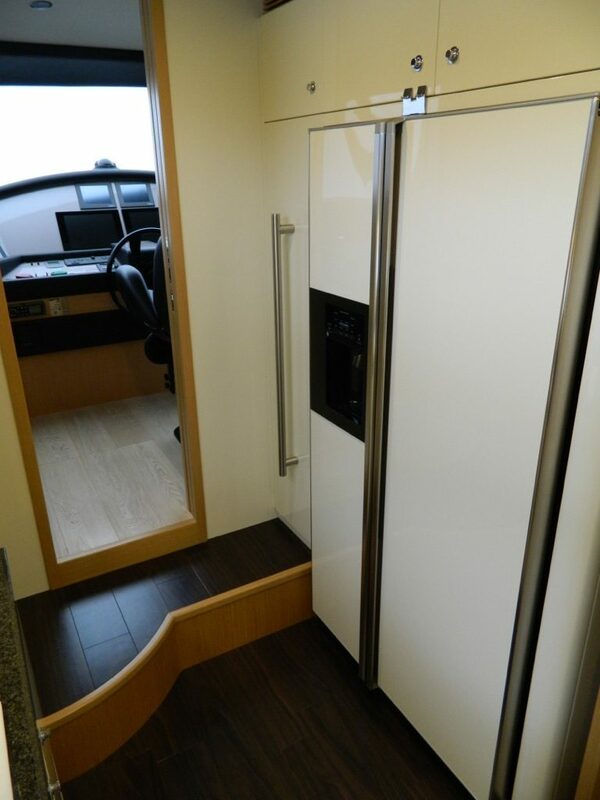 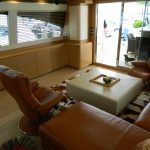 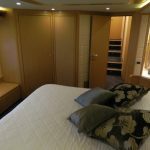 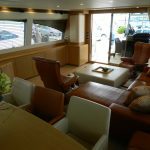 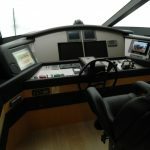 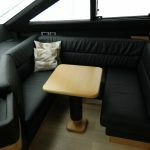 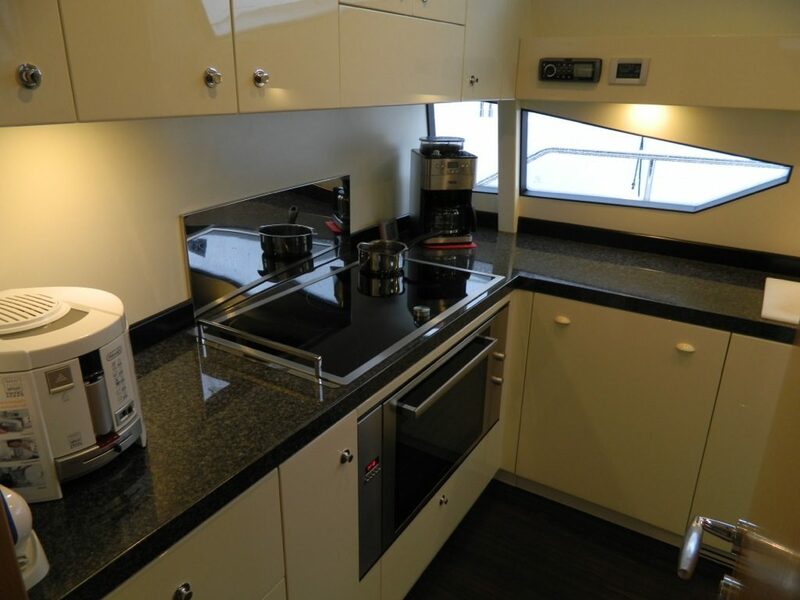 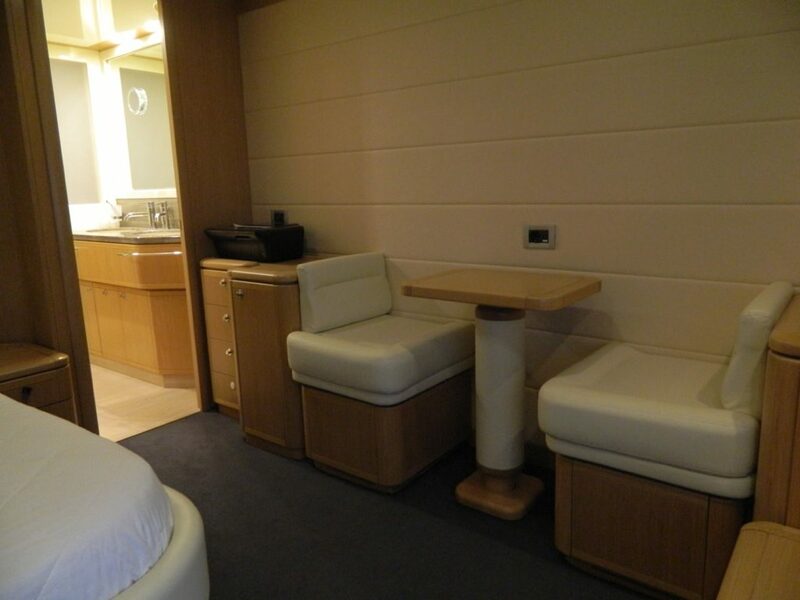 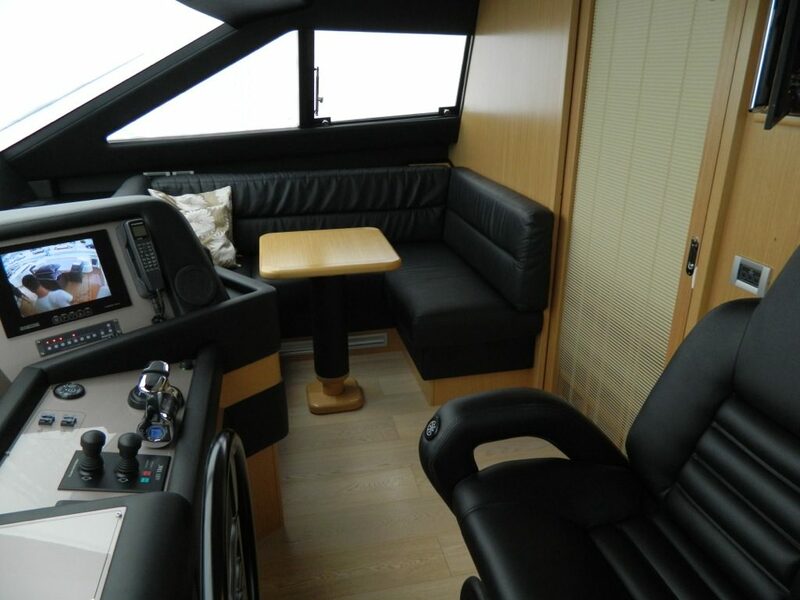 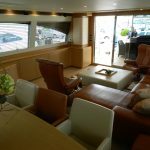 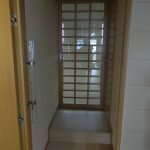 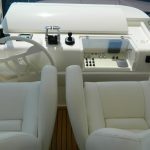 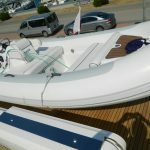 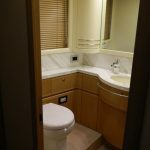 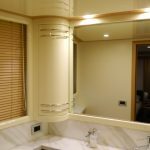 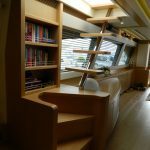 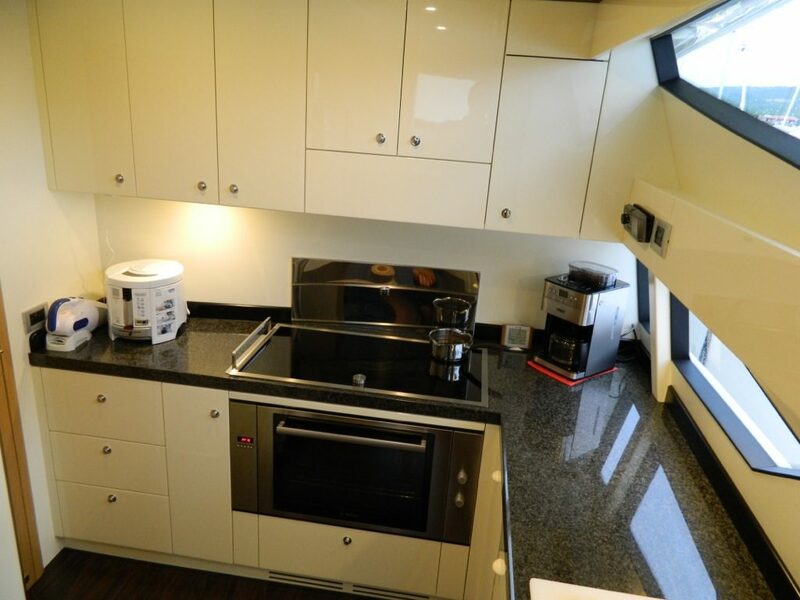 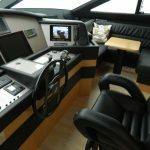 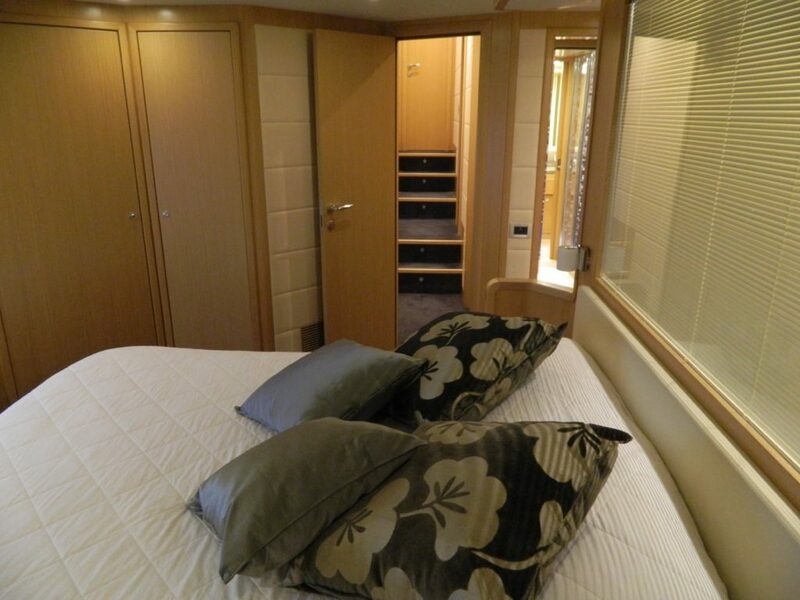 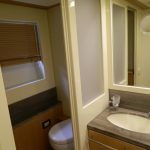 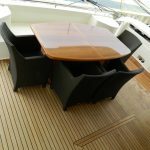 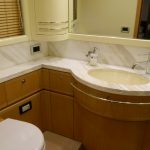 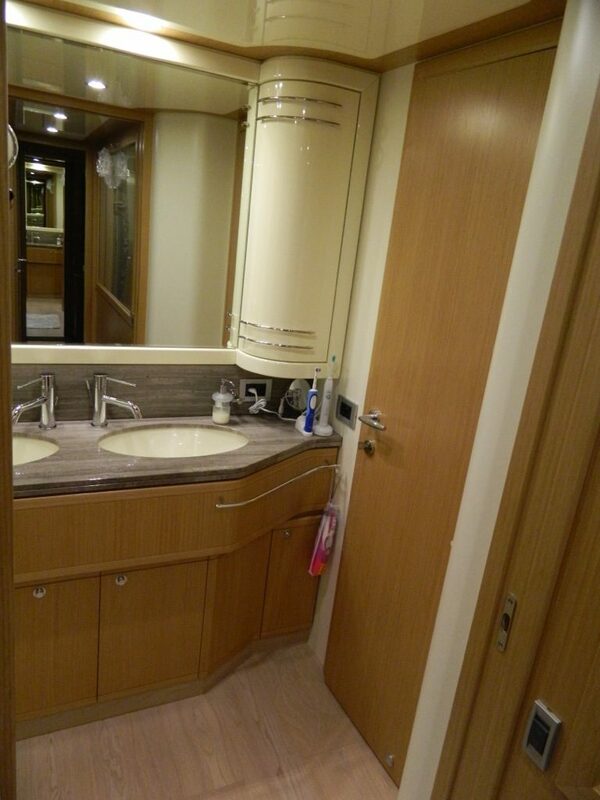 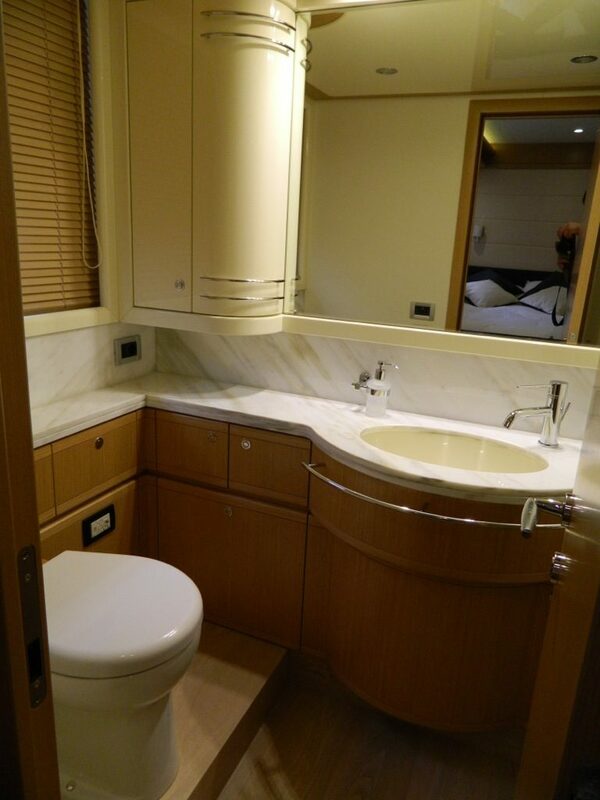 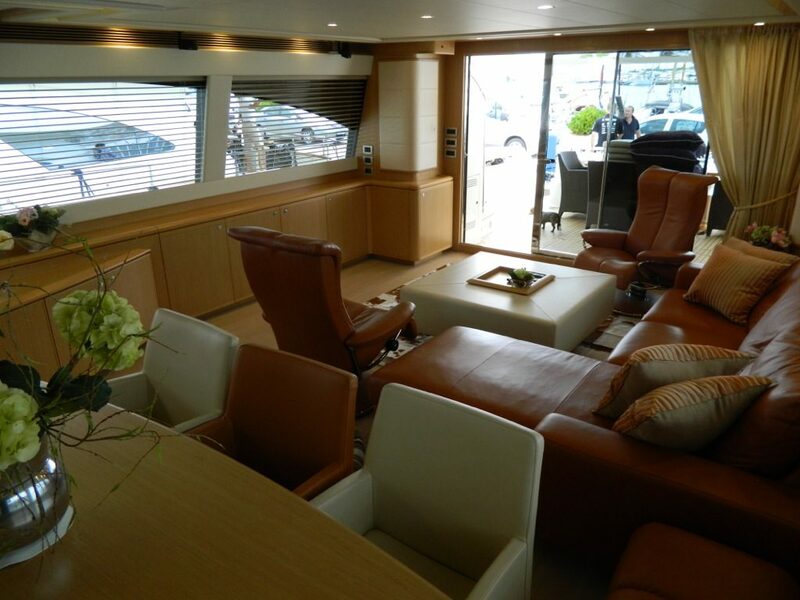 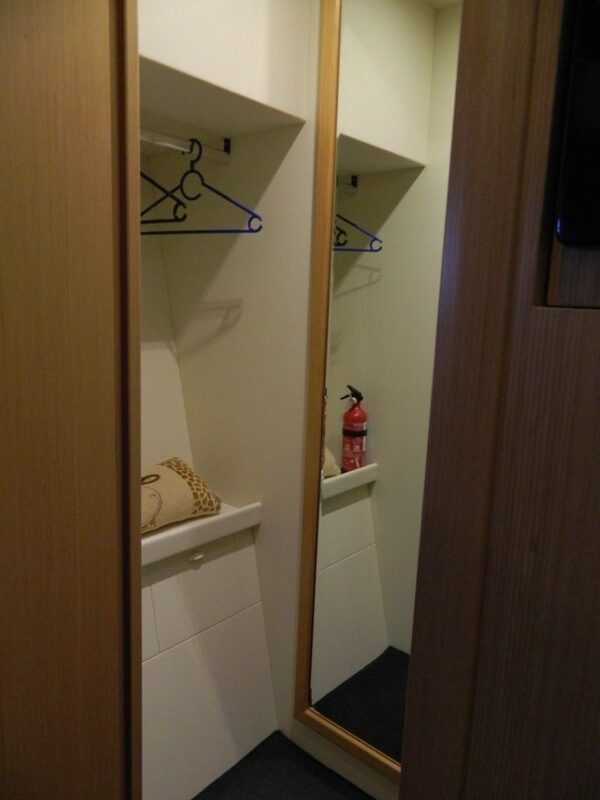 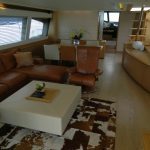 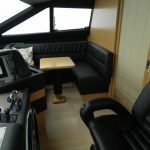 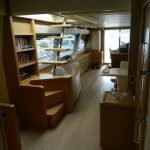 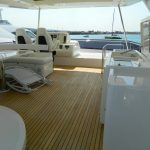 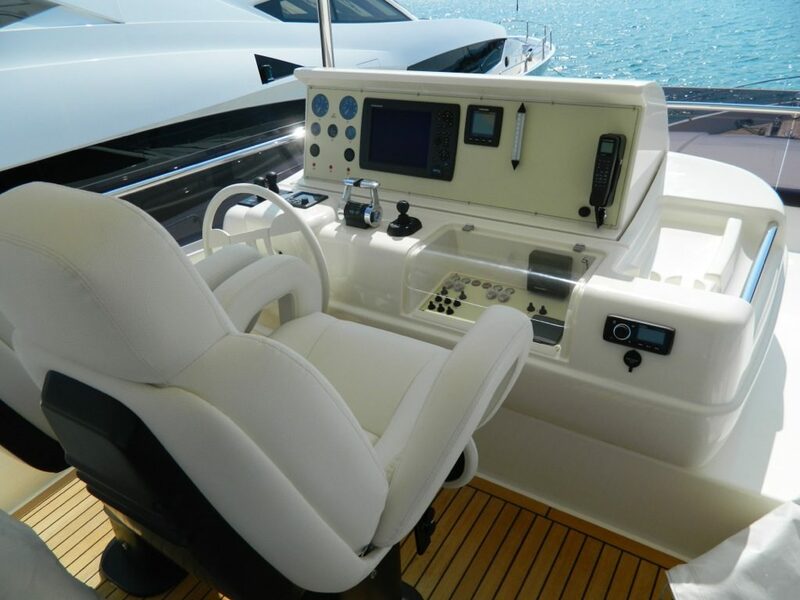 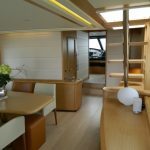 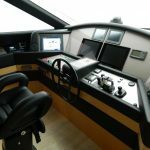 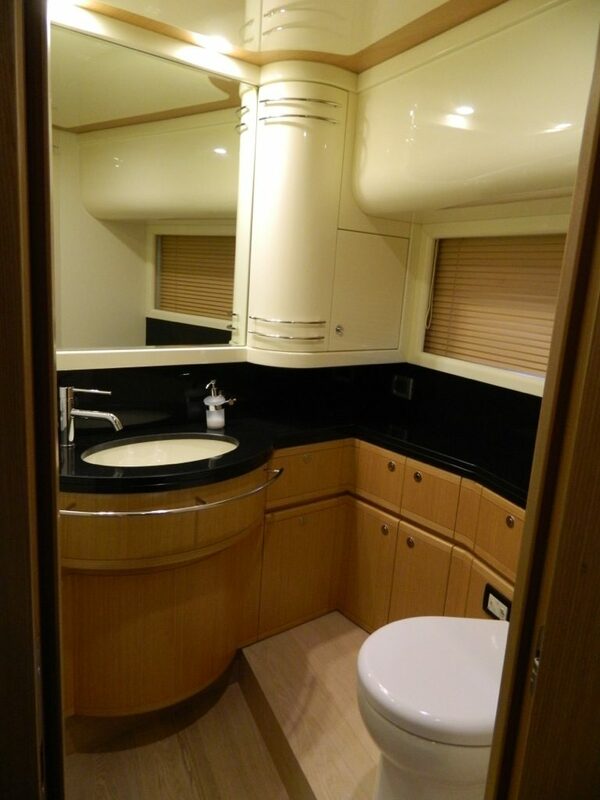 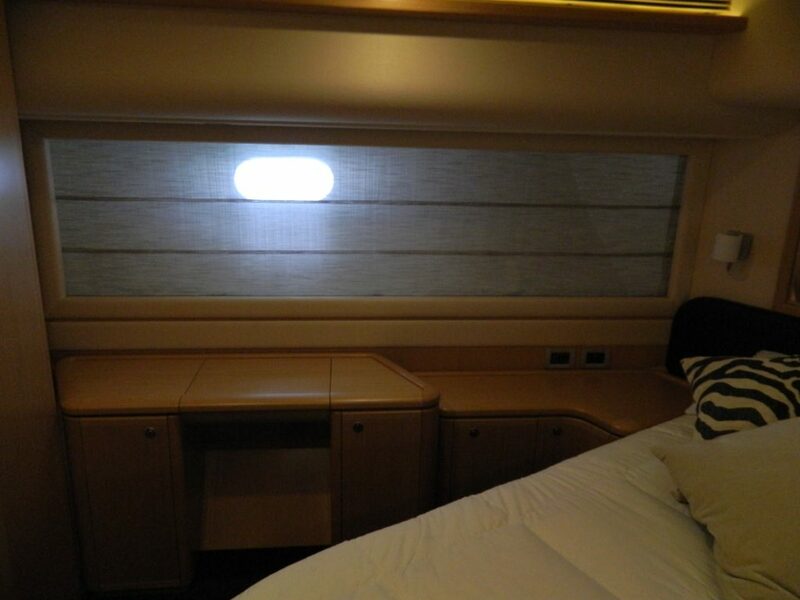 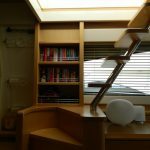 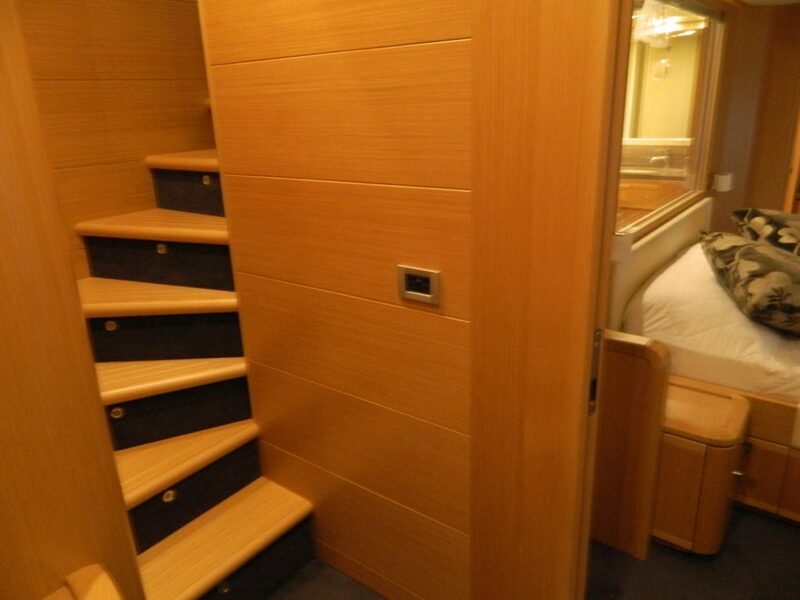 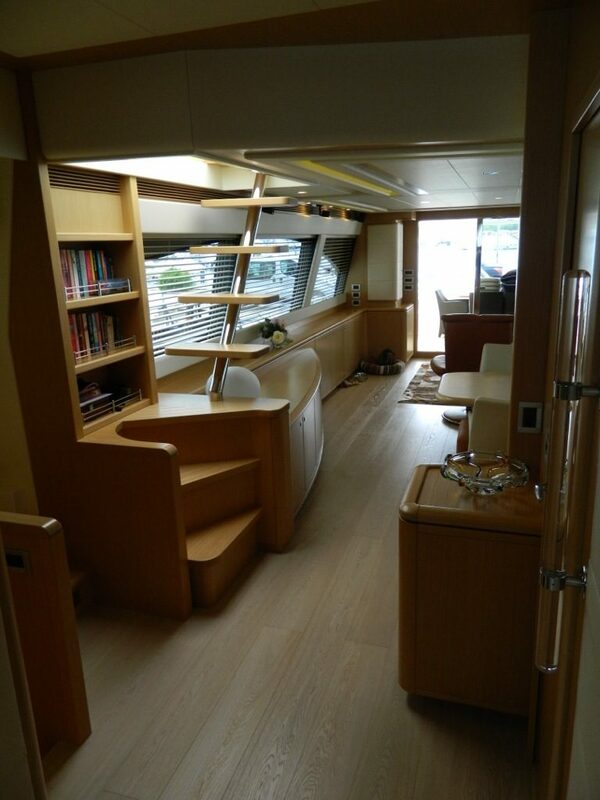 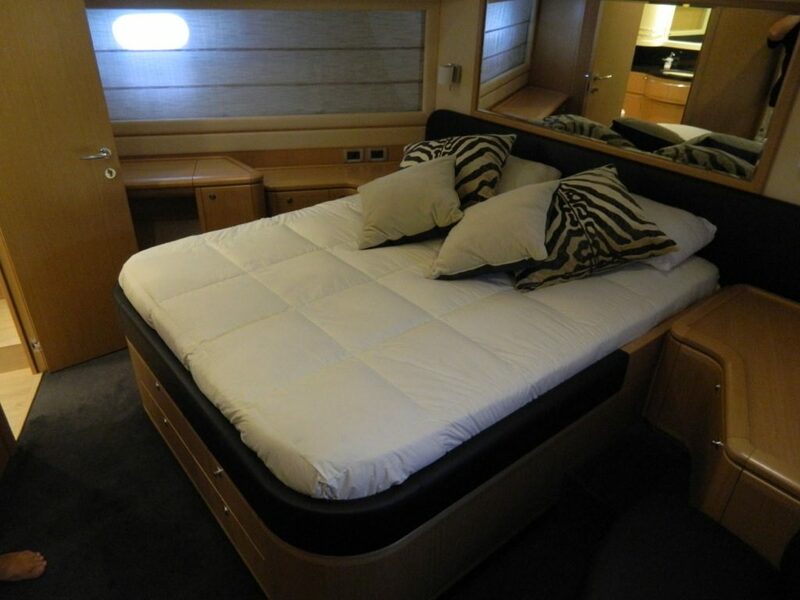 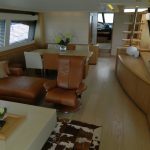 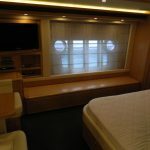 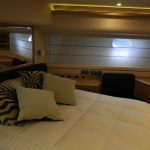 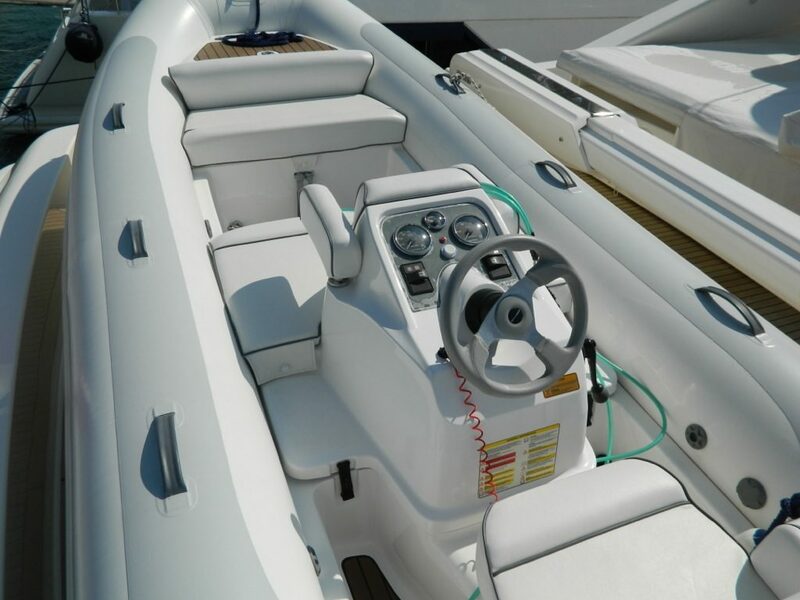 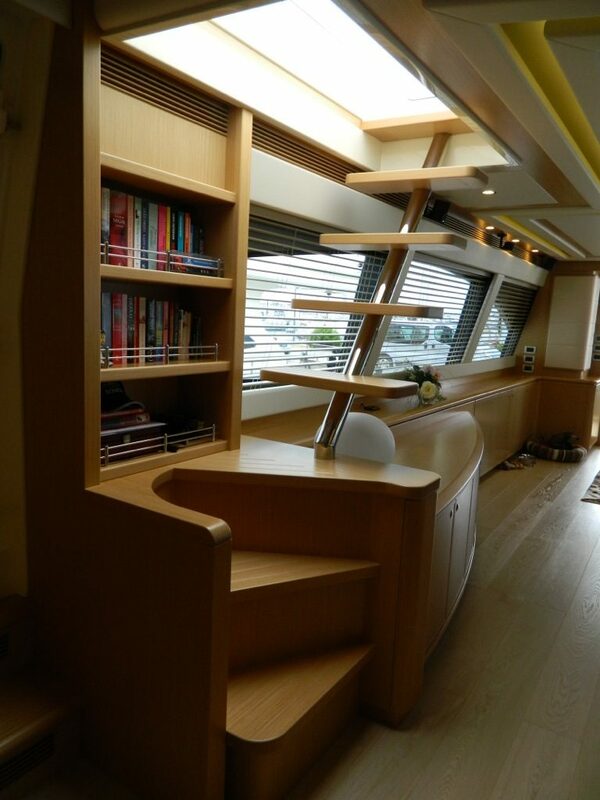 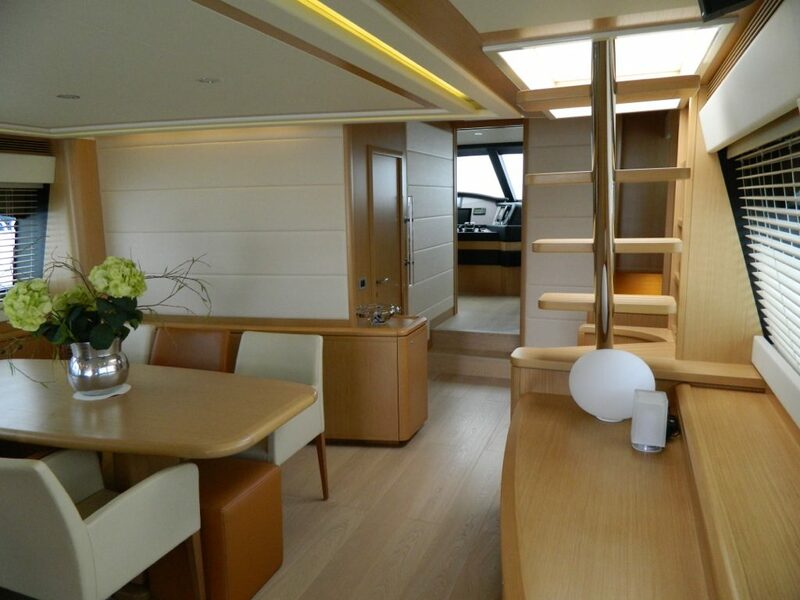 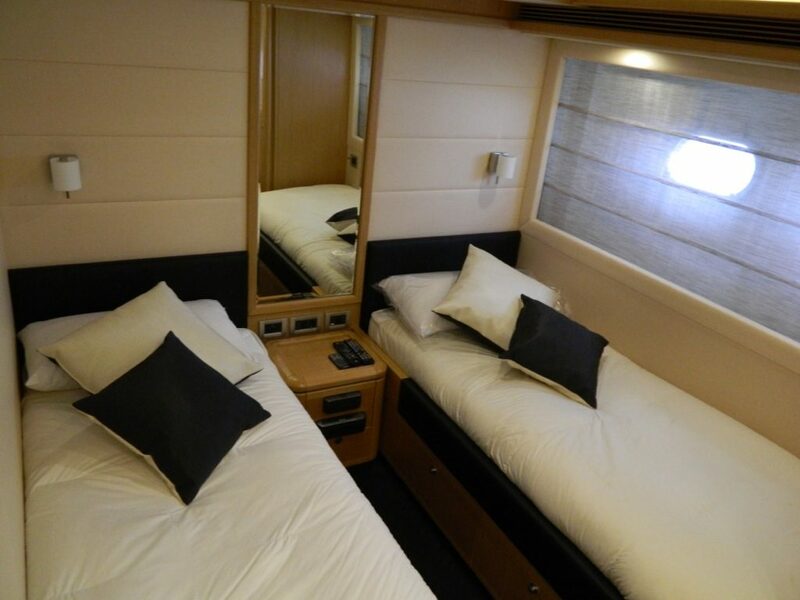 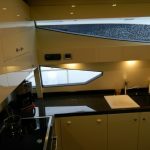 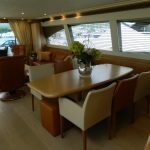 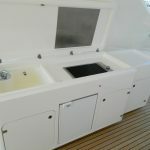 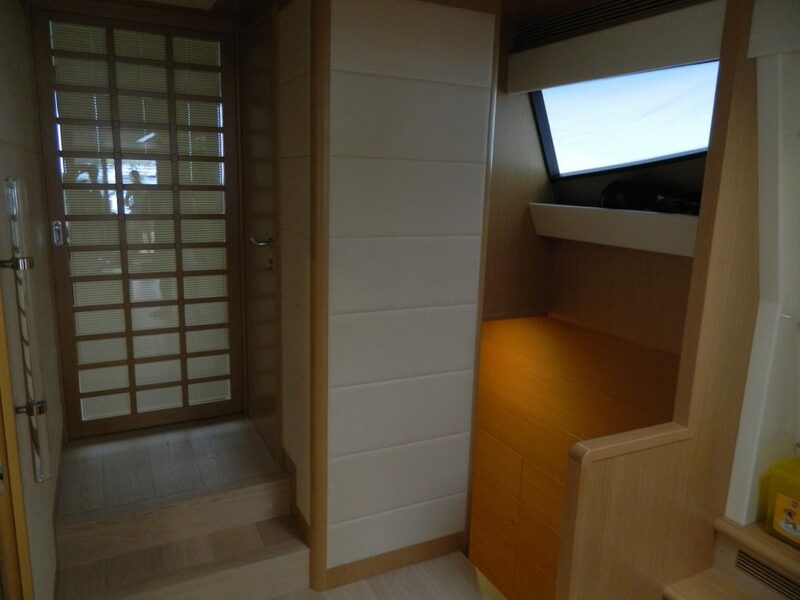 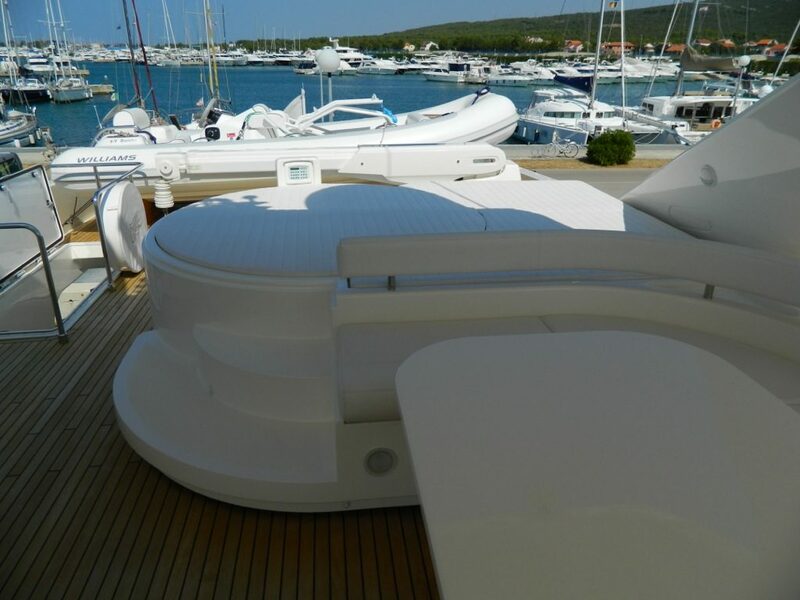 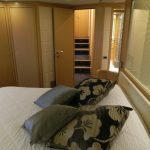 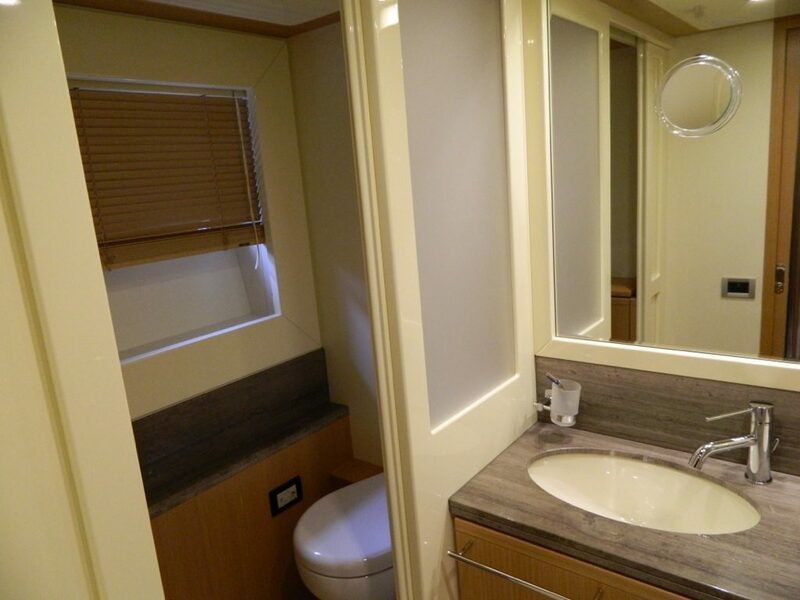 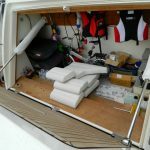 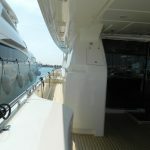 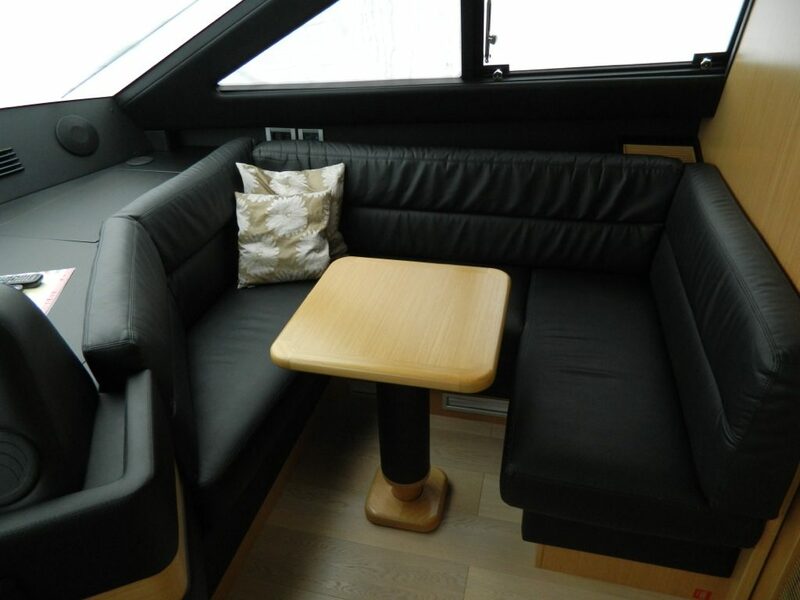 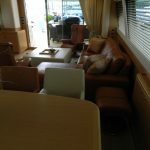 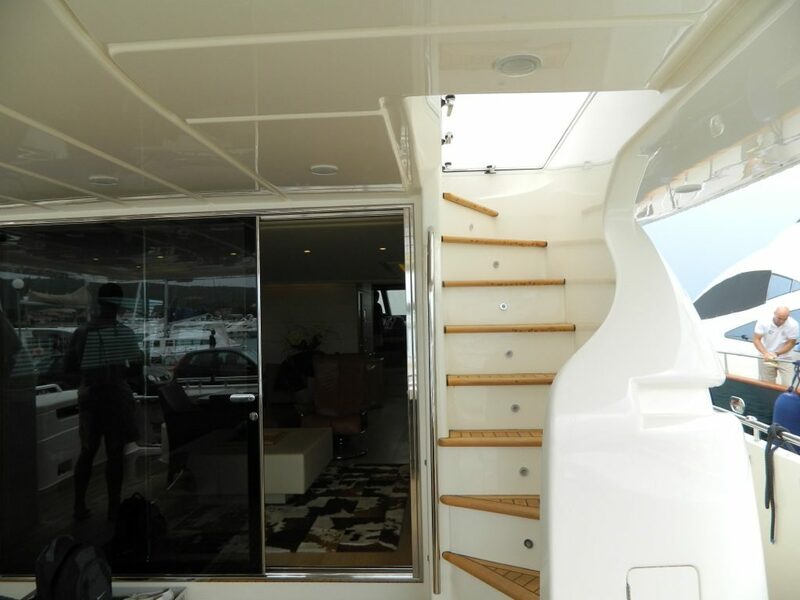 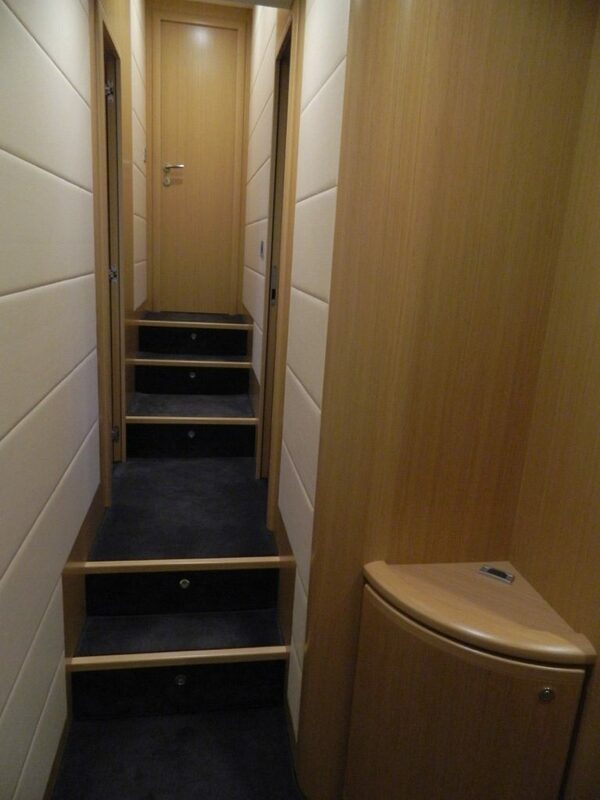 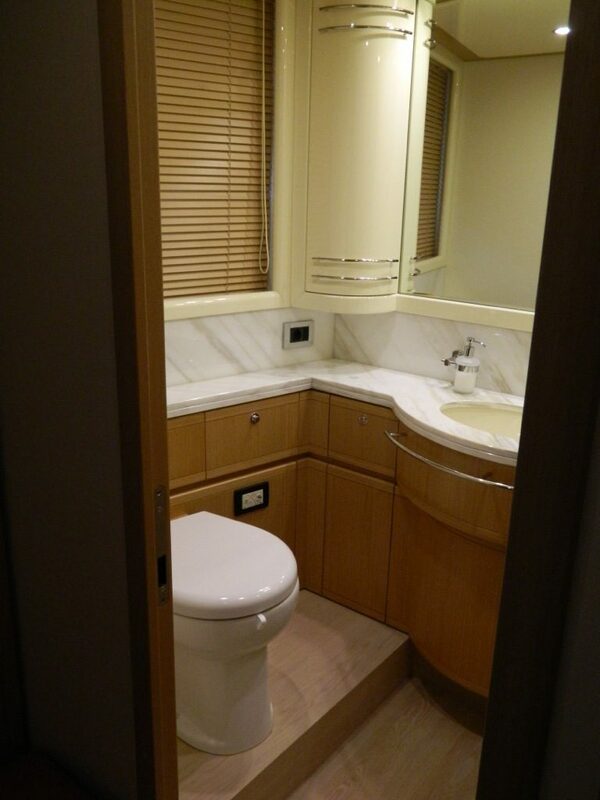 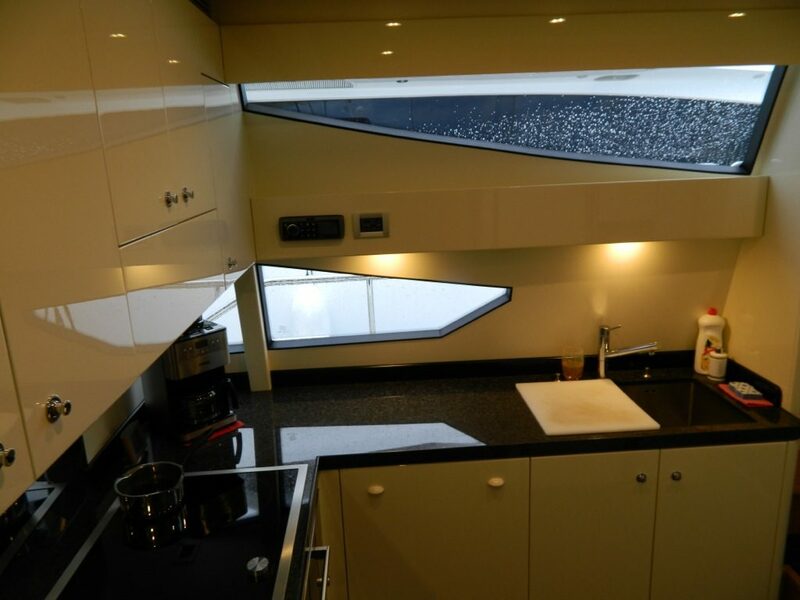 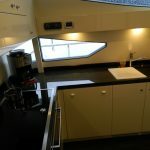 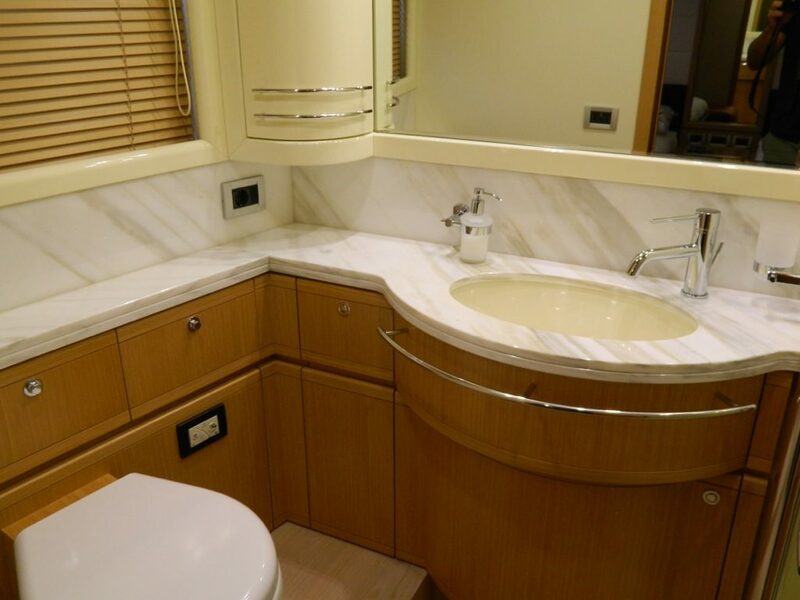 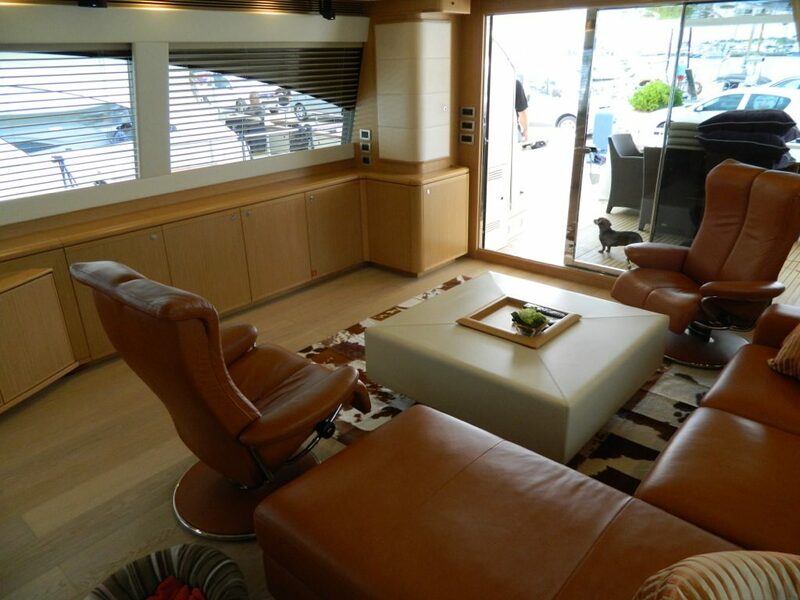 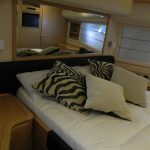 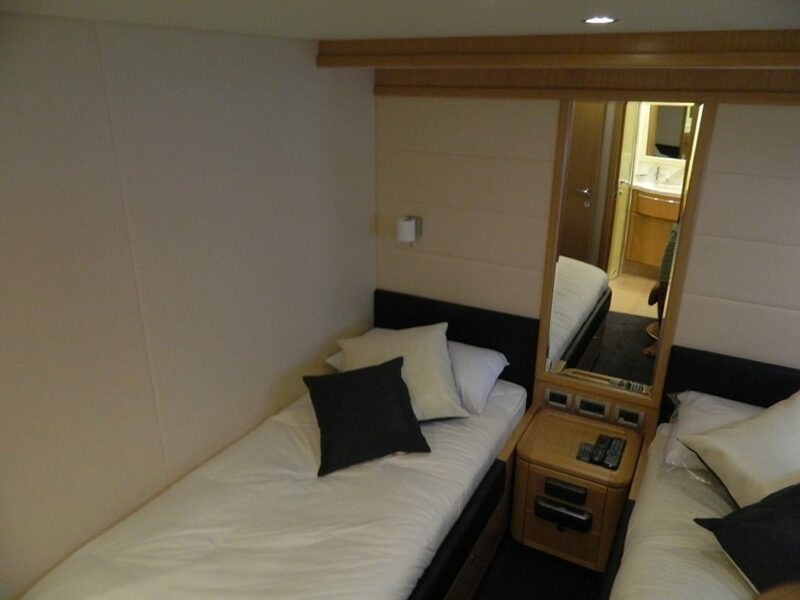 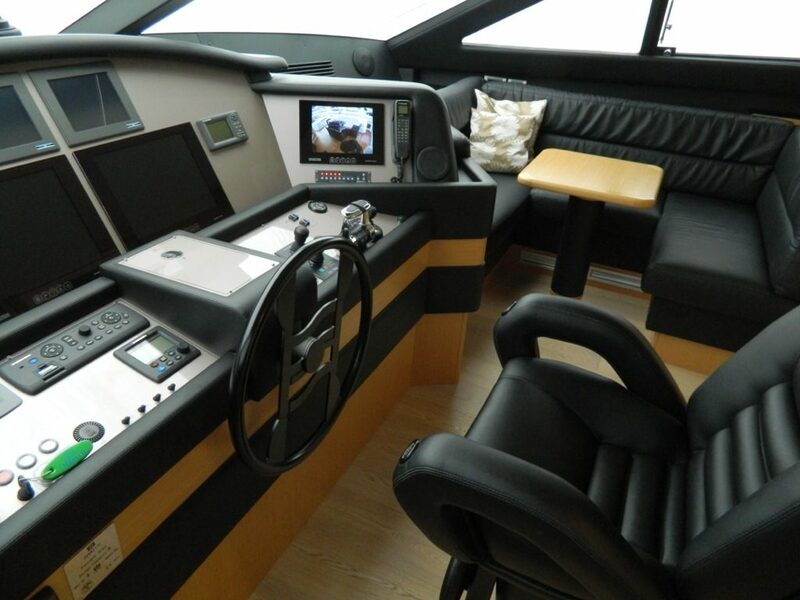 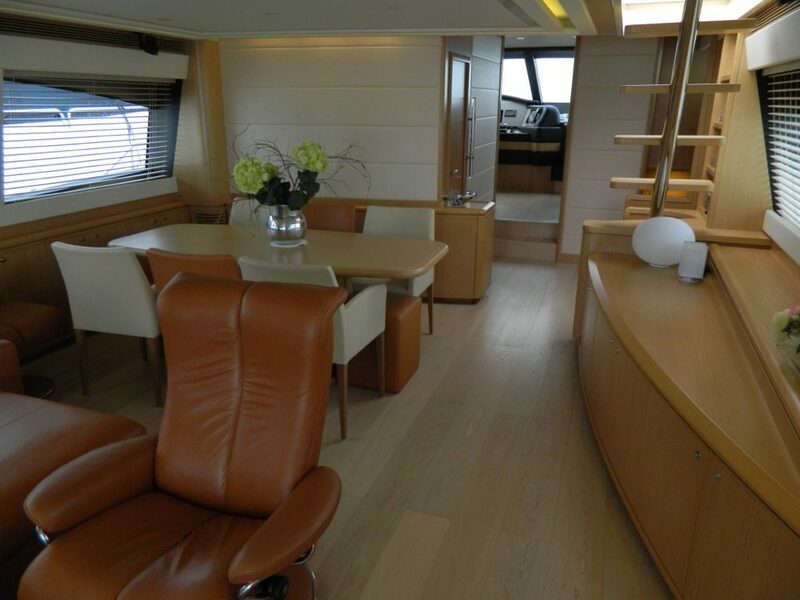 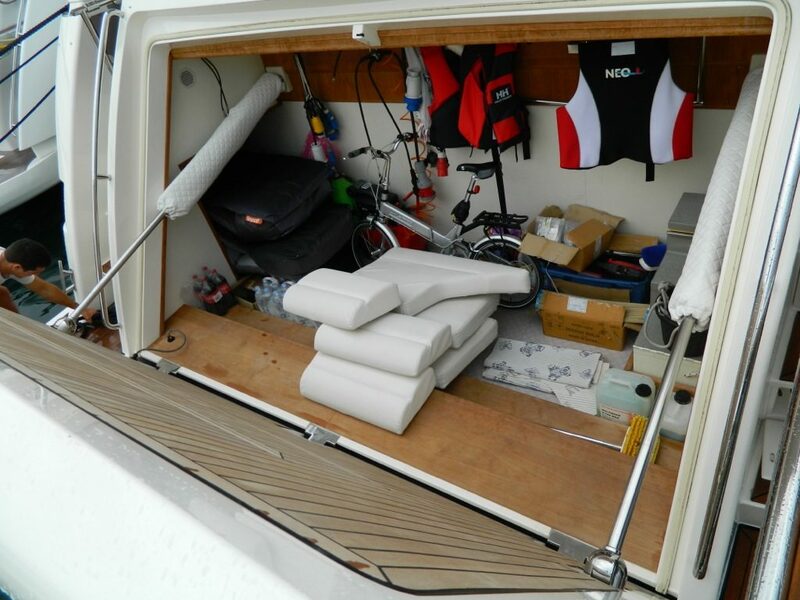 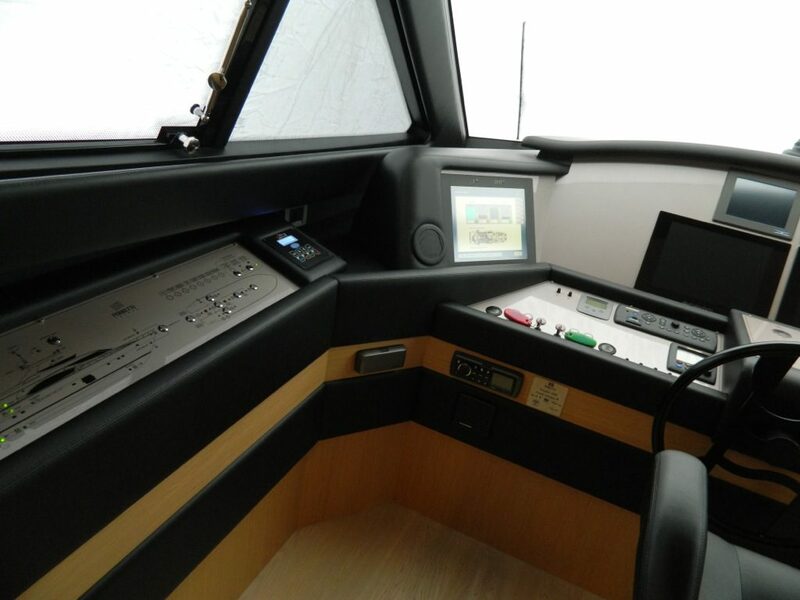 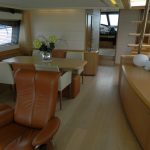 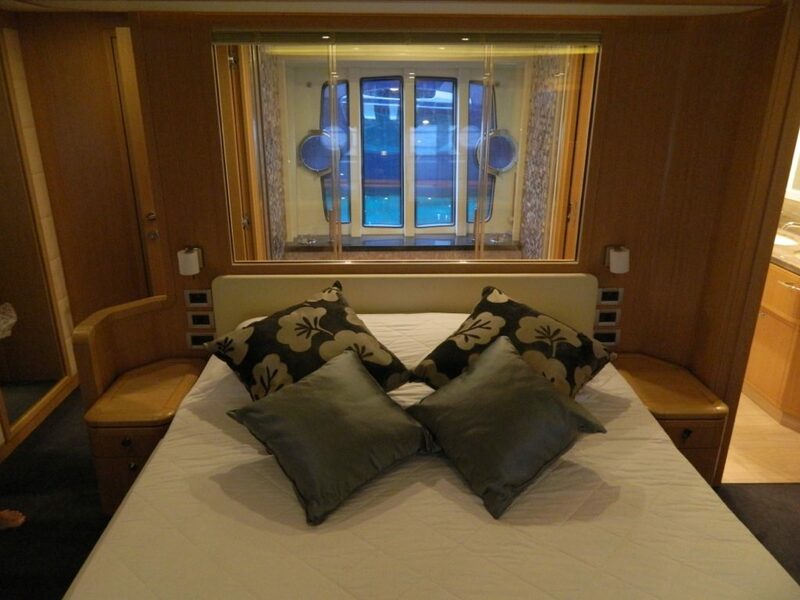 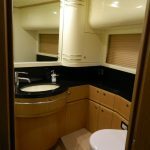 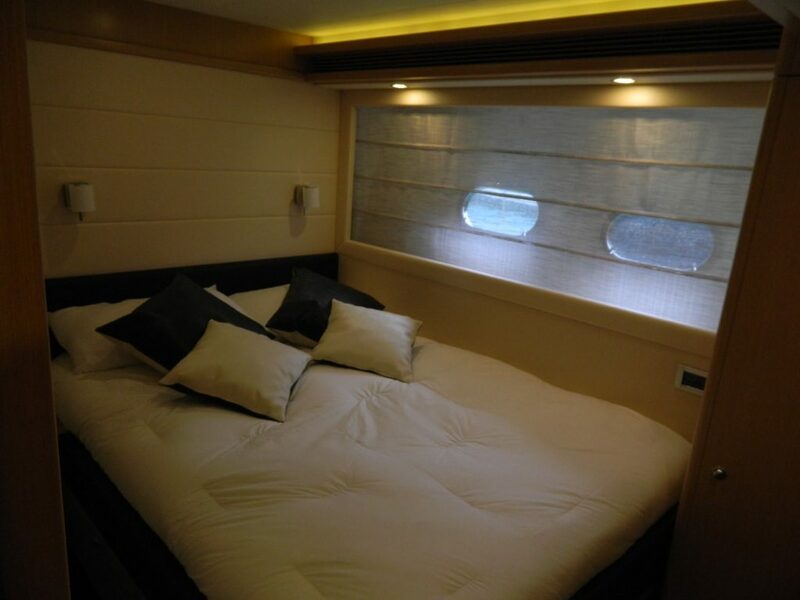 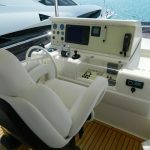 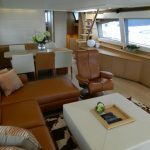 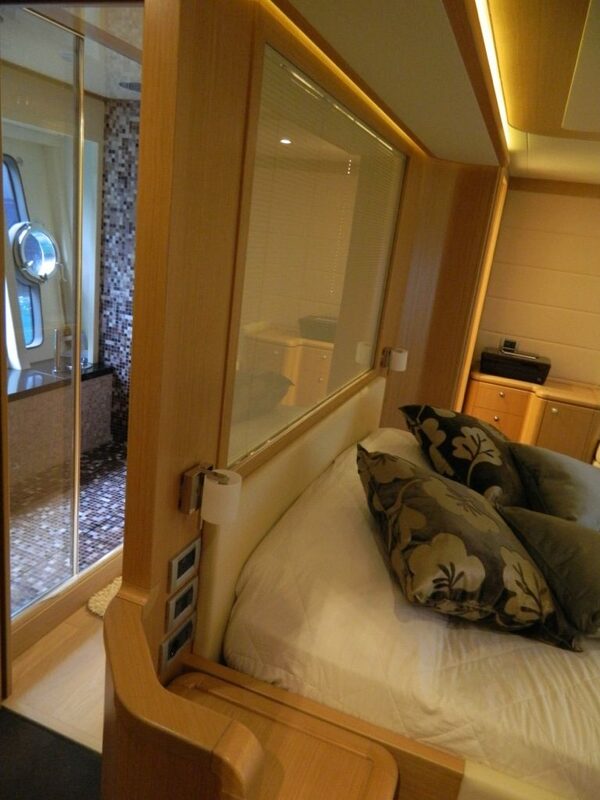 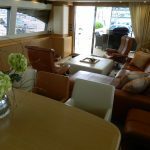 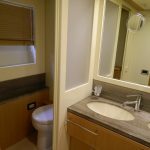 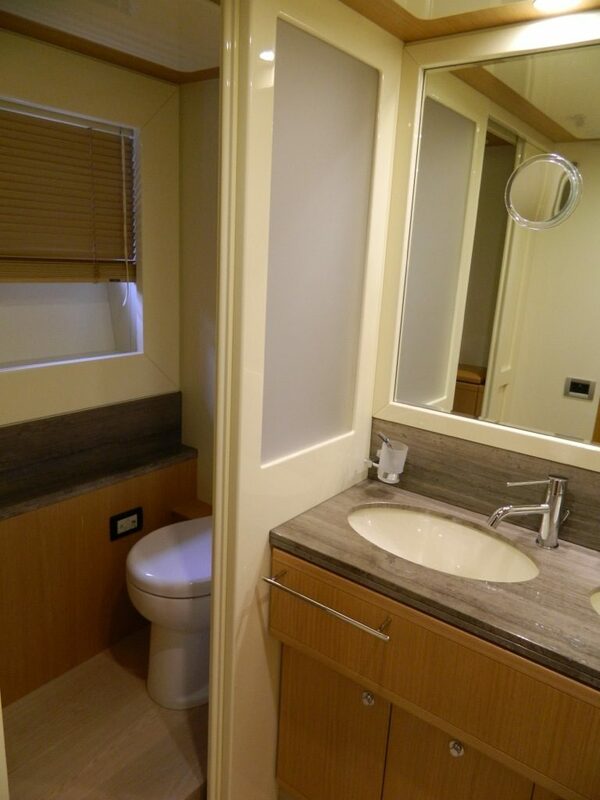 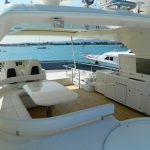 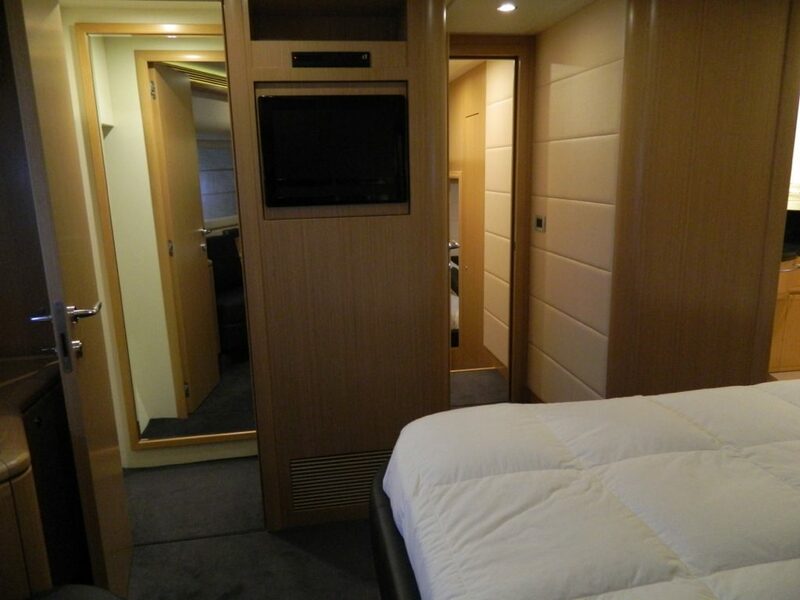 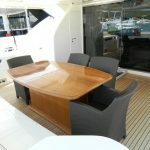 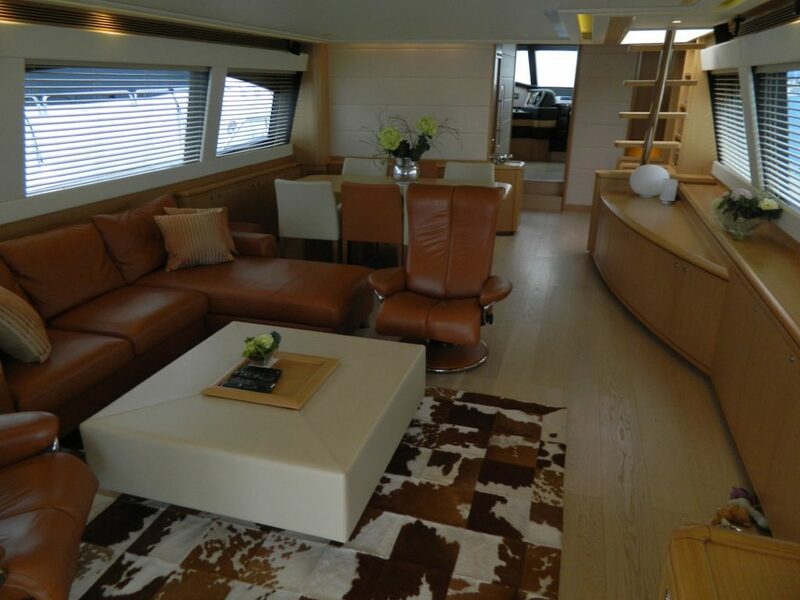 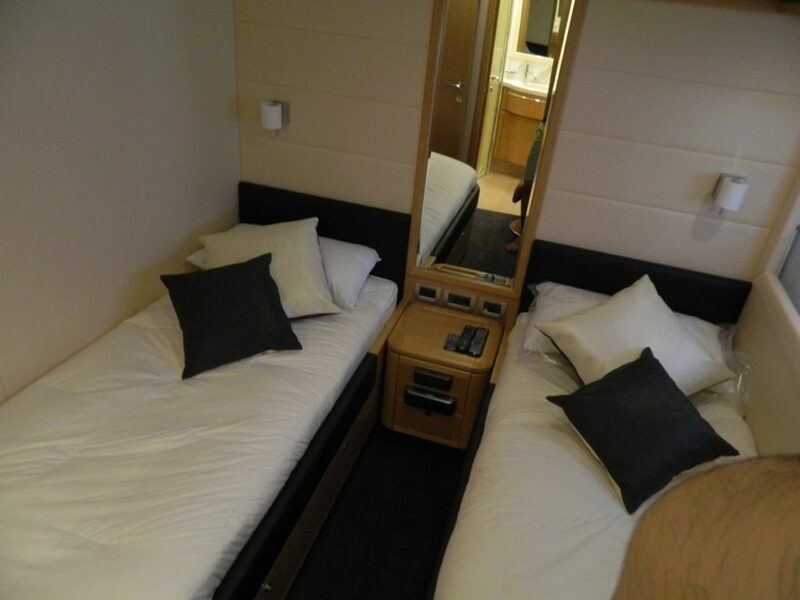 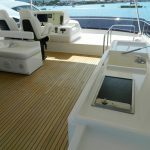 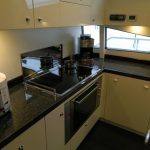 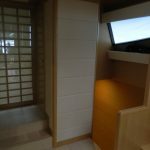 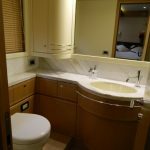 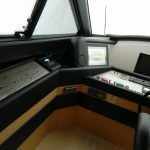 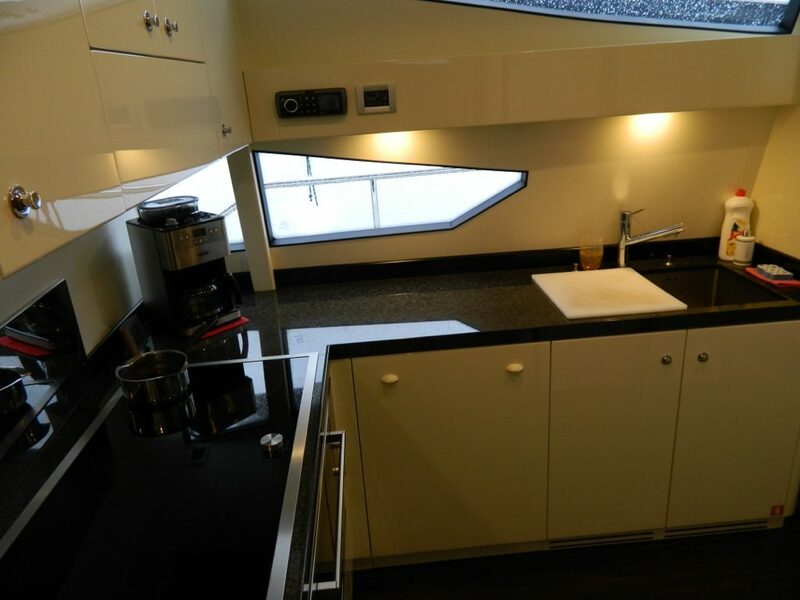 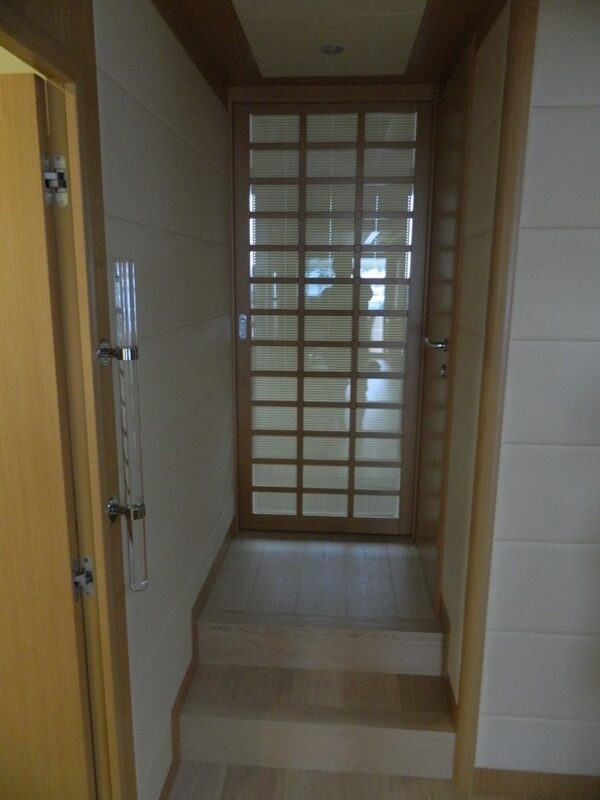 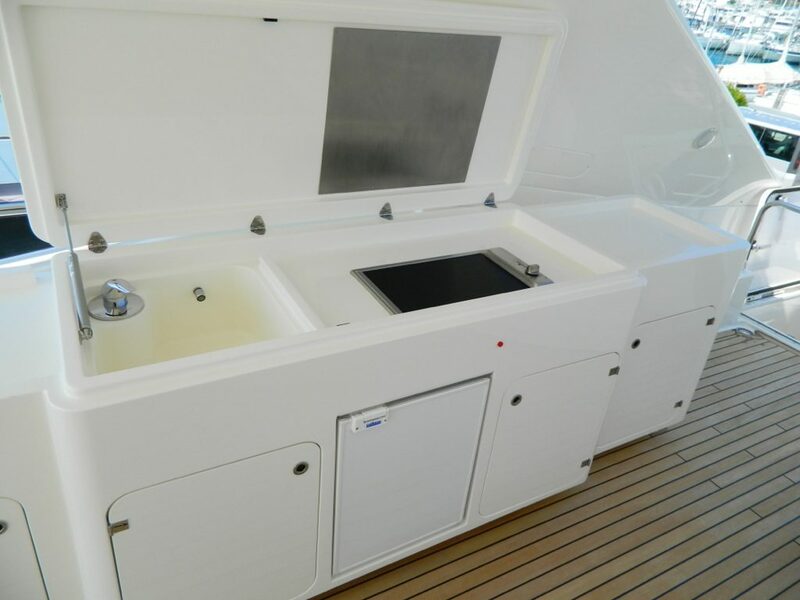 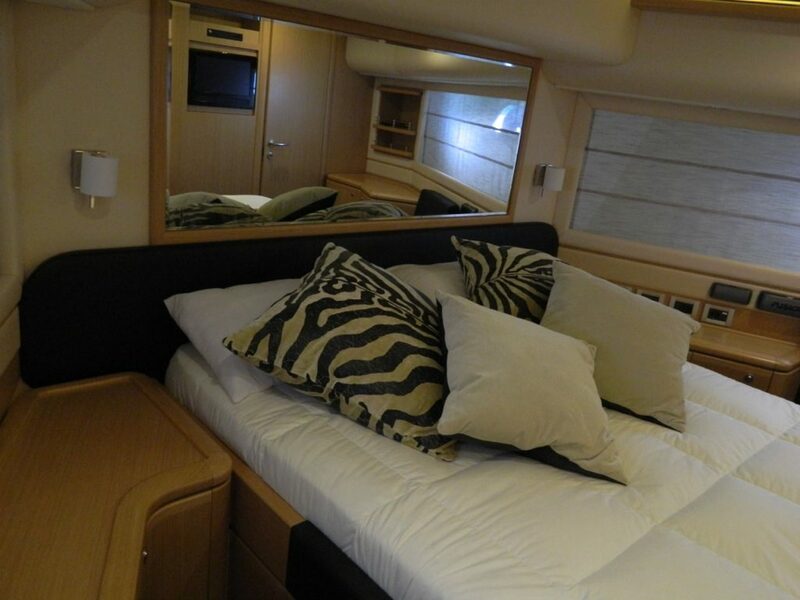 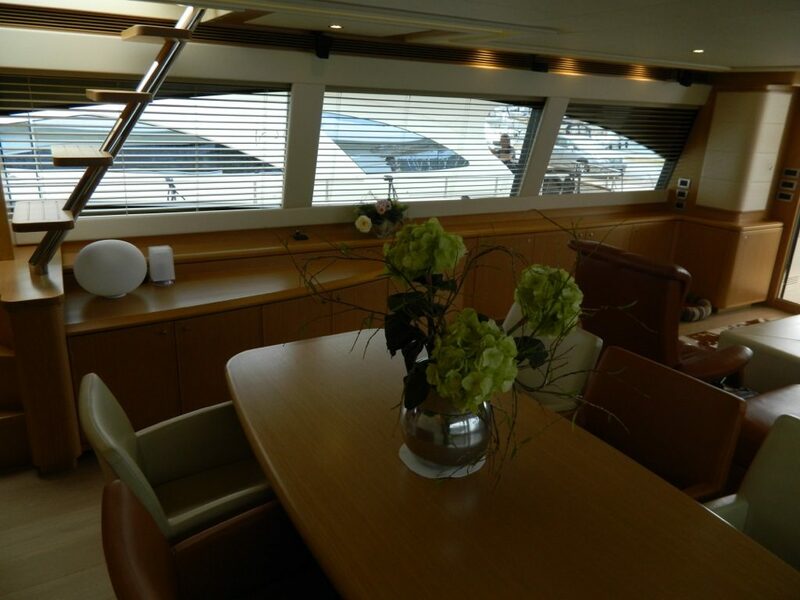 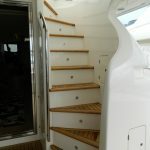 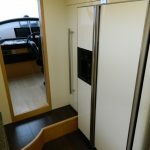 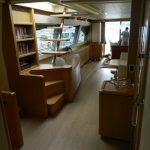 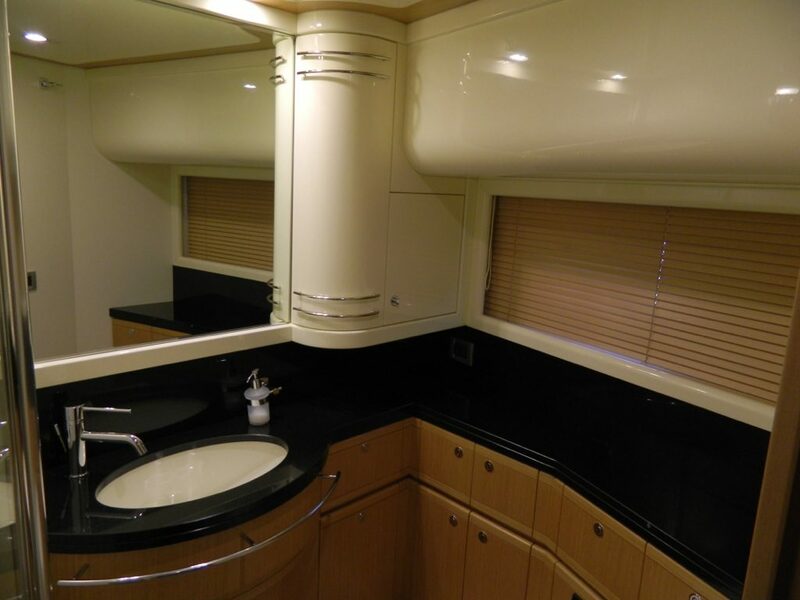 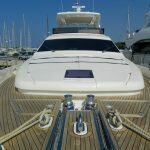 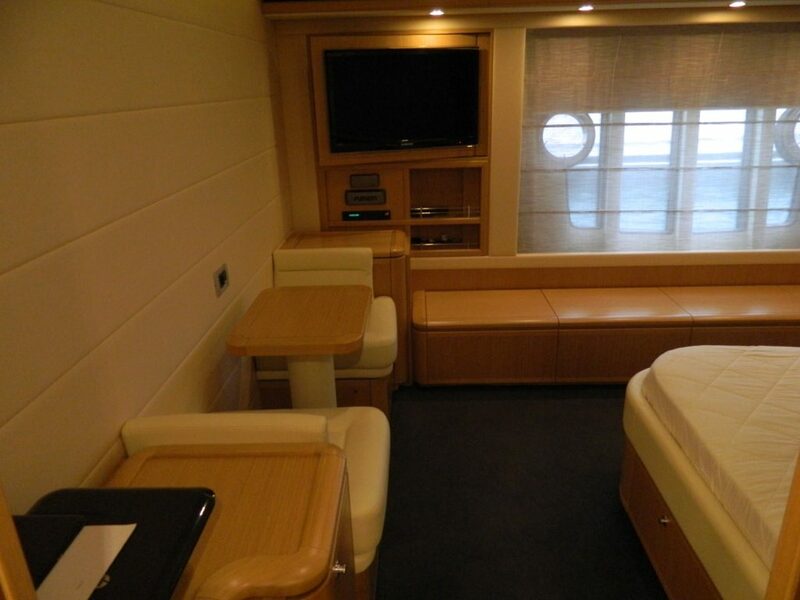 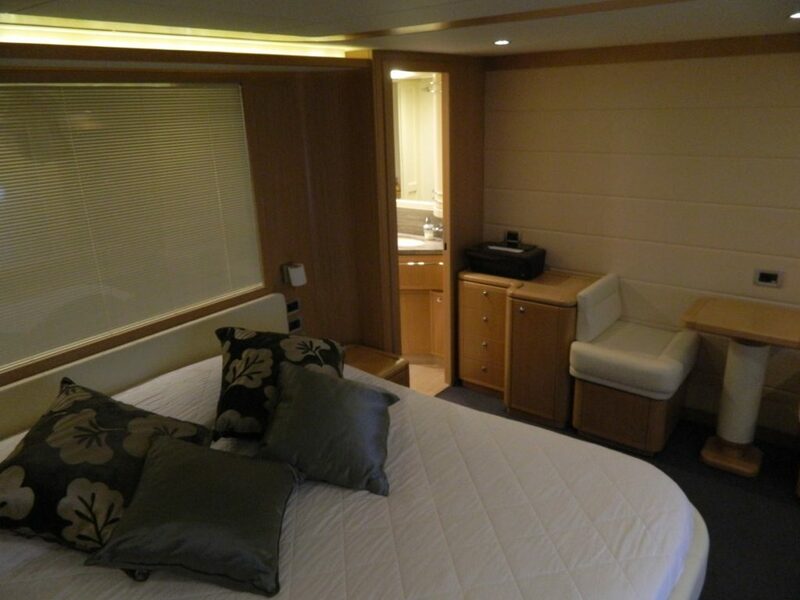 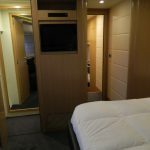 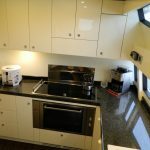 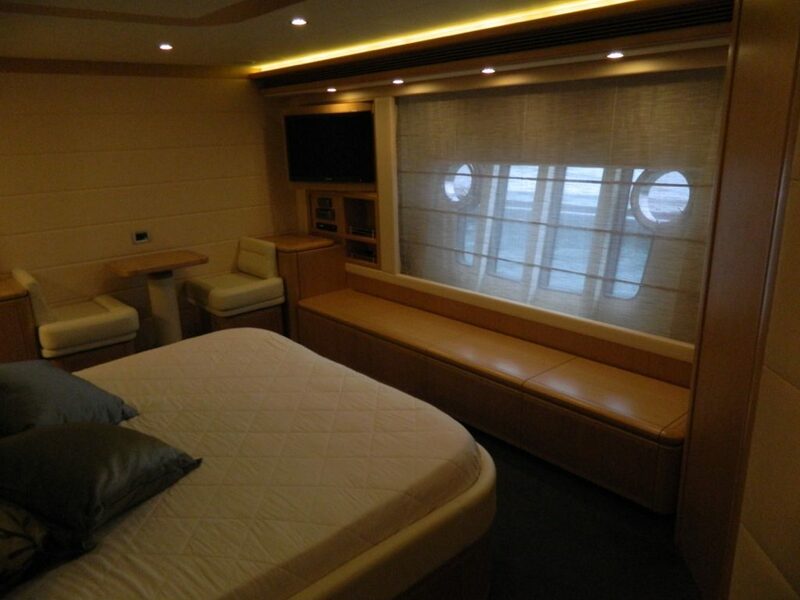 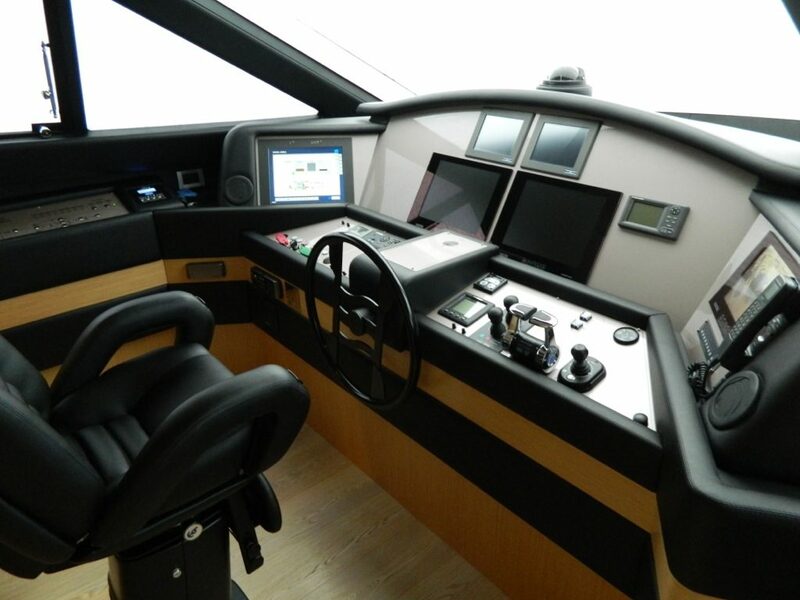 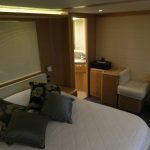 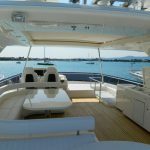 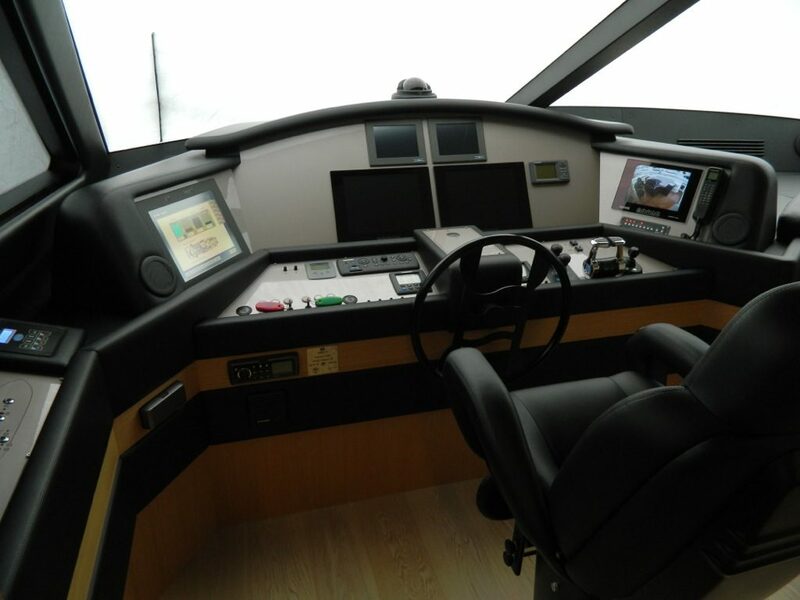 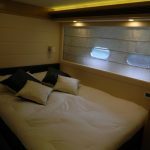 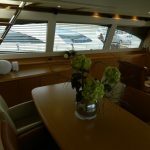 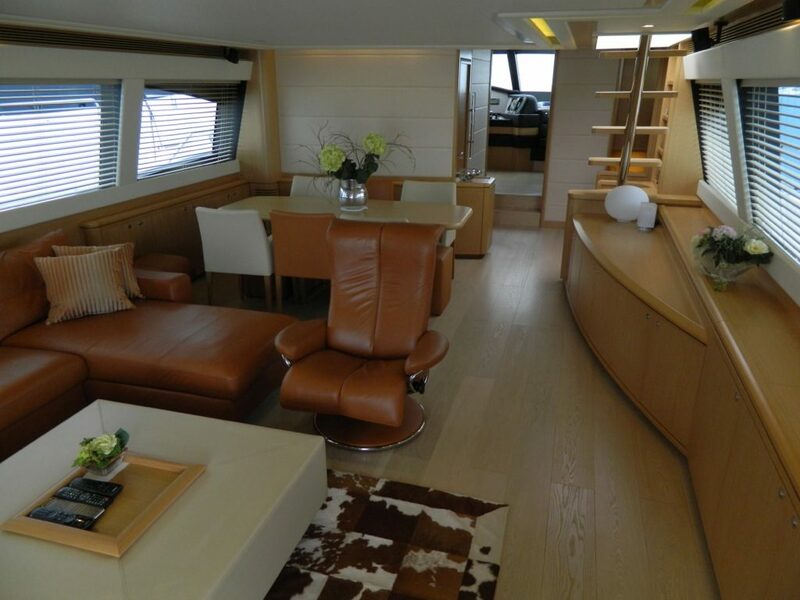 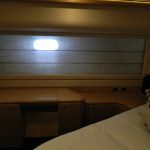 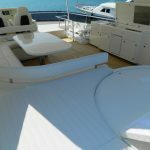 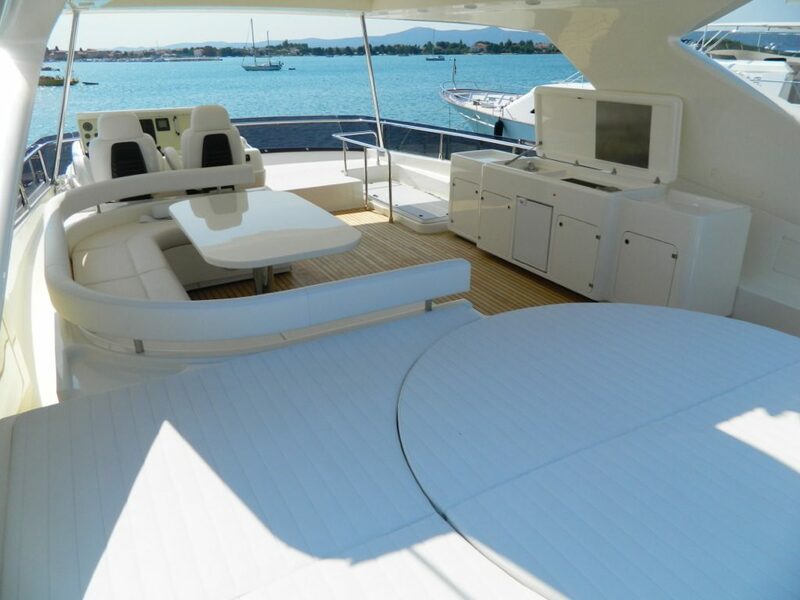 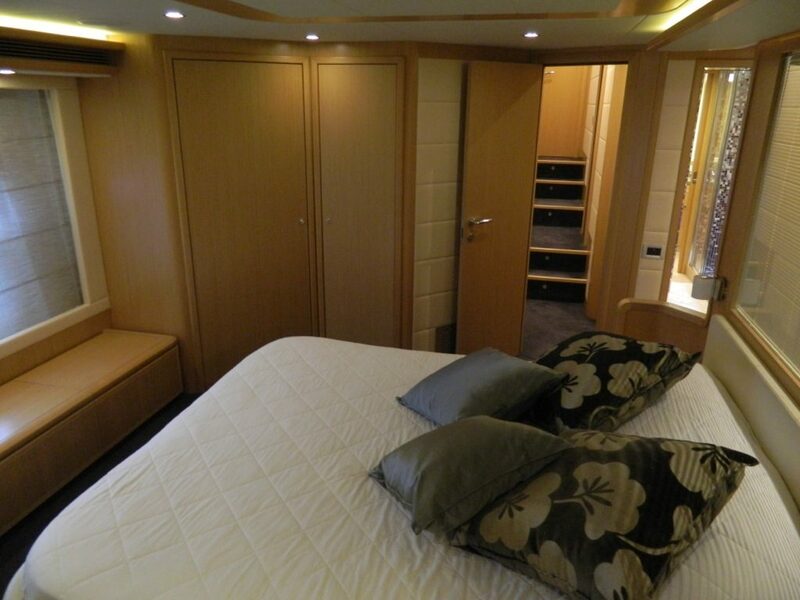 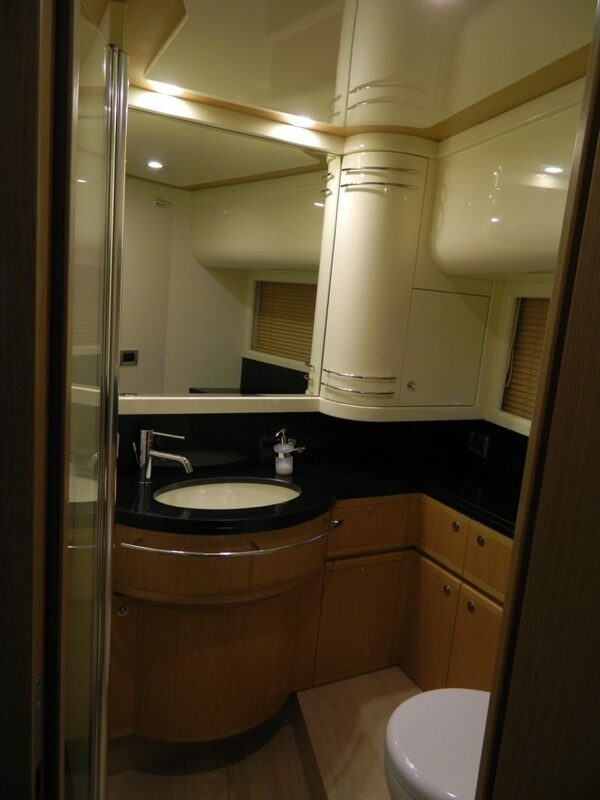 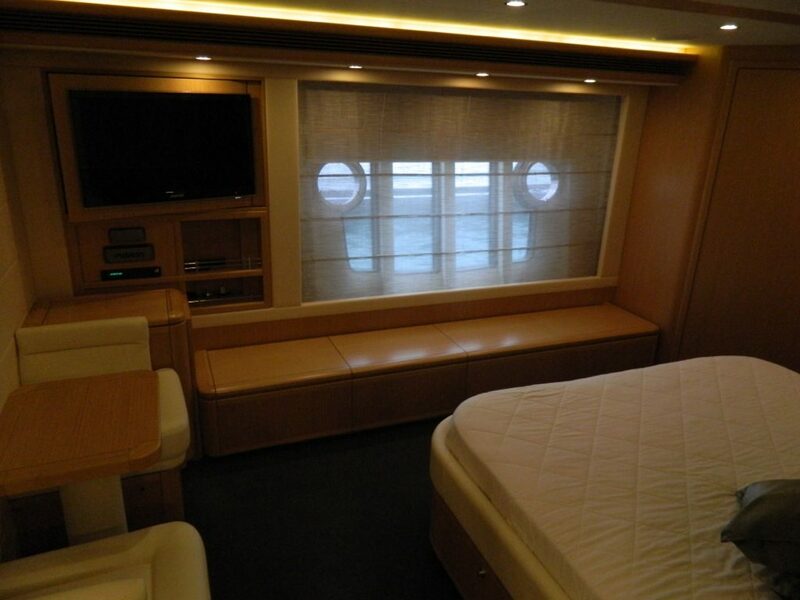 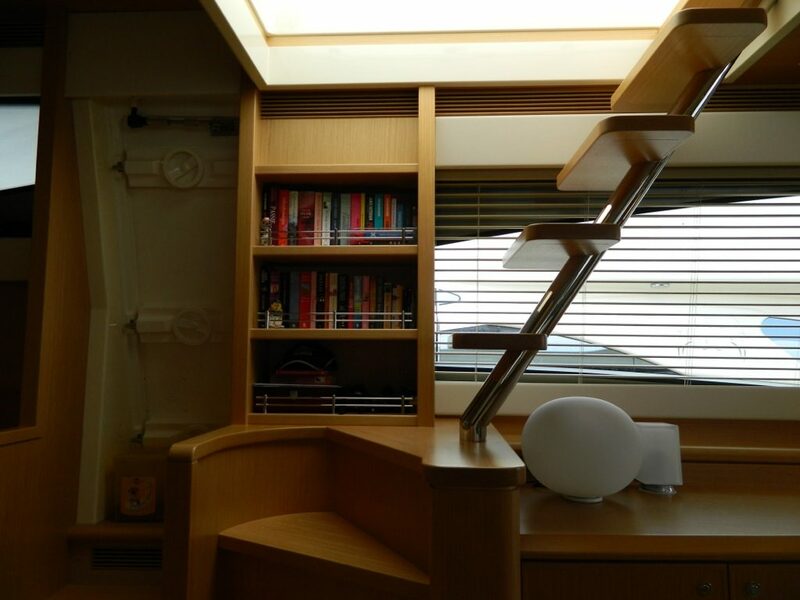 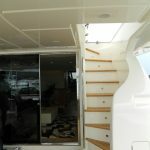 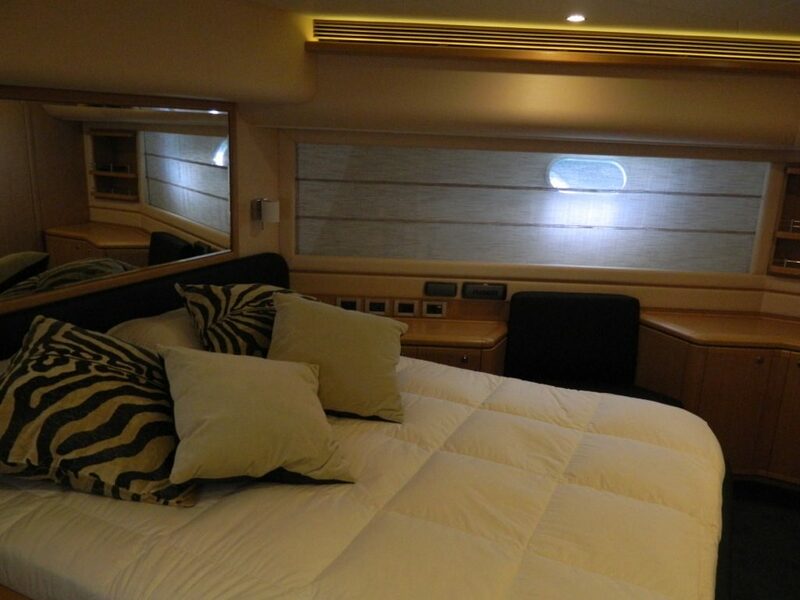 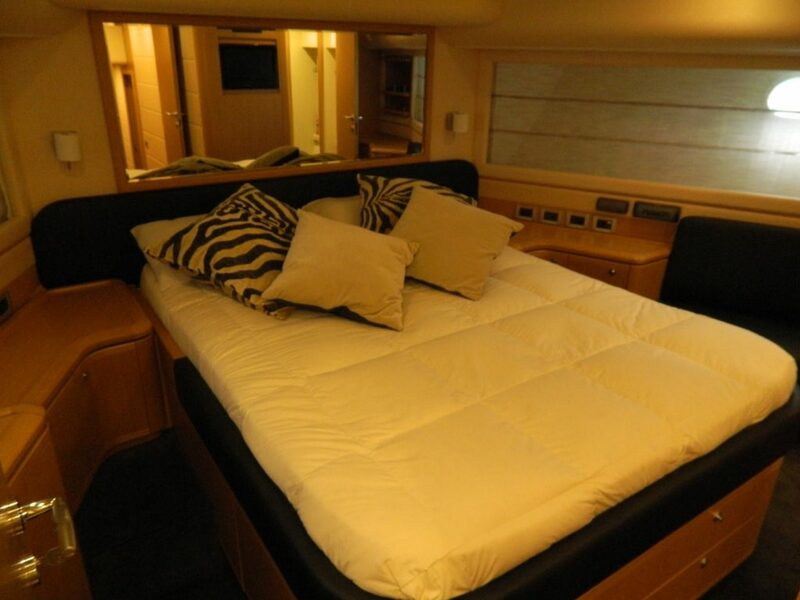 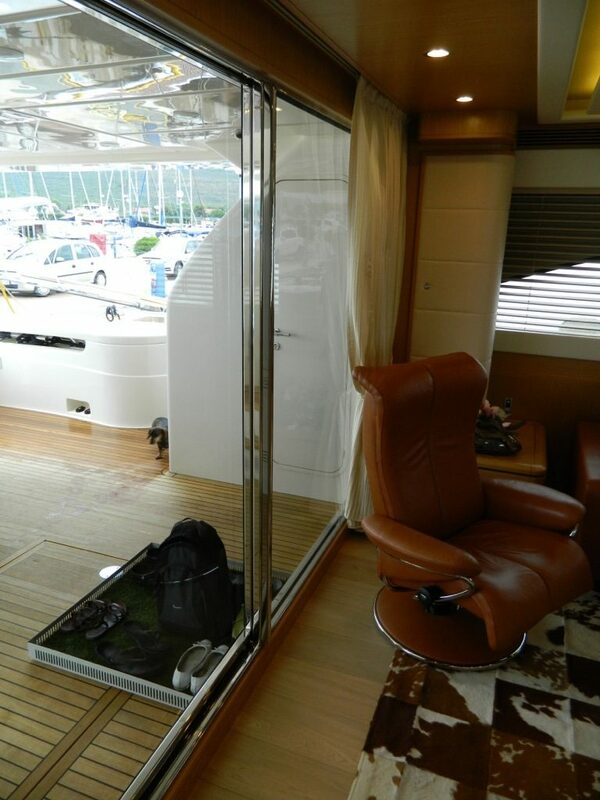 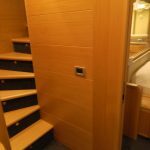 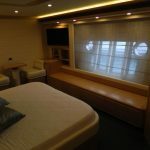 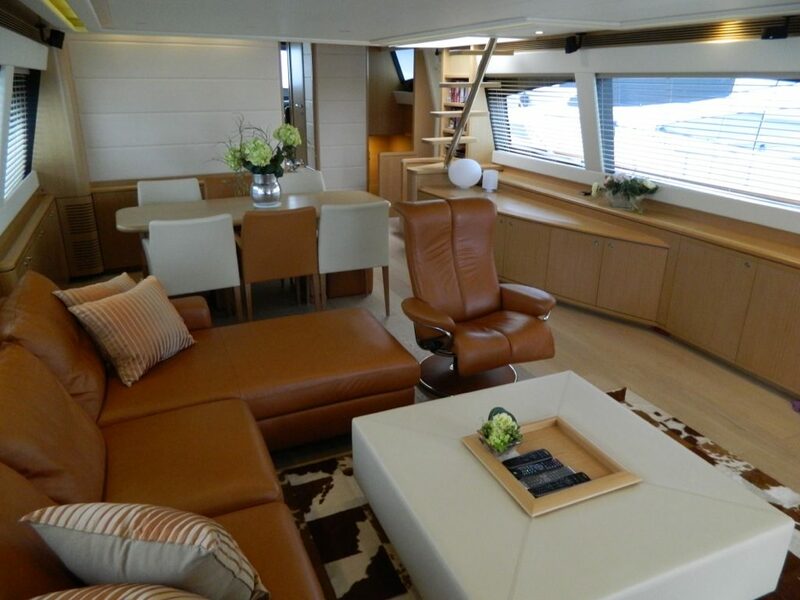 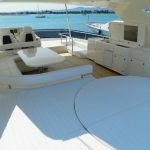 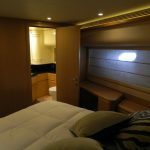 The master’s cabin, situated in a new transversal position in the boat’s centre, presents two large windows that offer a particularly wide view of the sea and hosts. 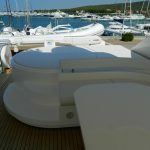 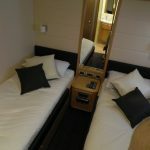 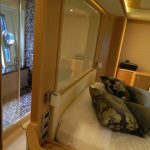 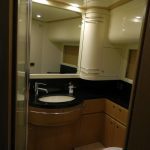 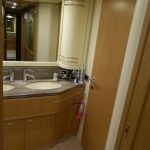 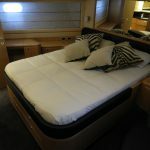 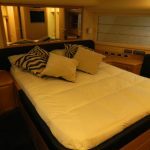 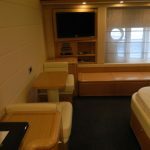 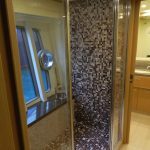 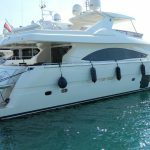 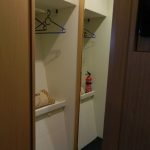 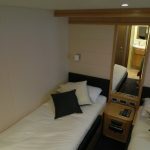 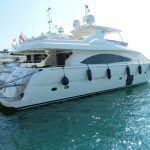 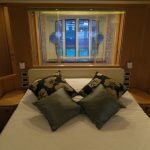 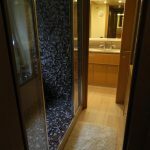 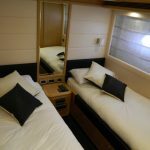 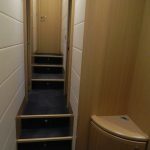 There are also two guest cabins and a large VIP cabin with a double bed, all of them furnished with bathrooms plus shower. 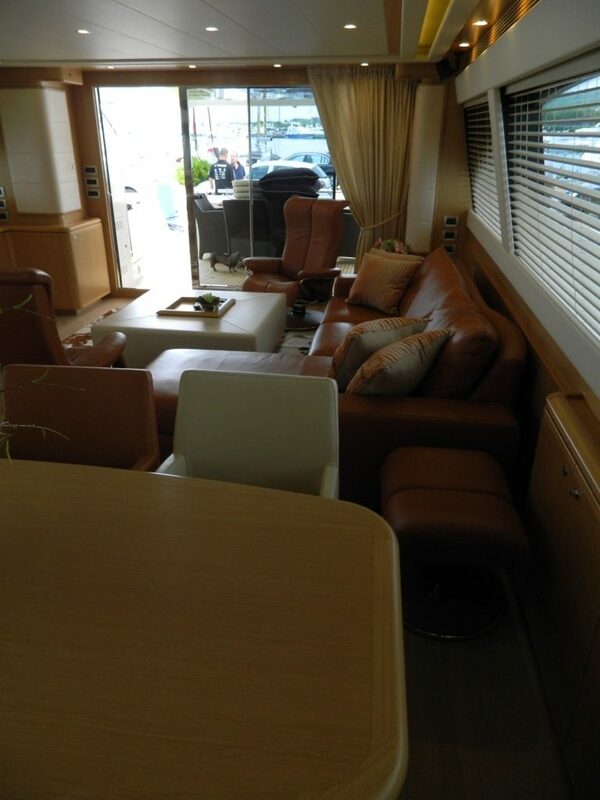 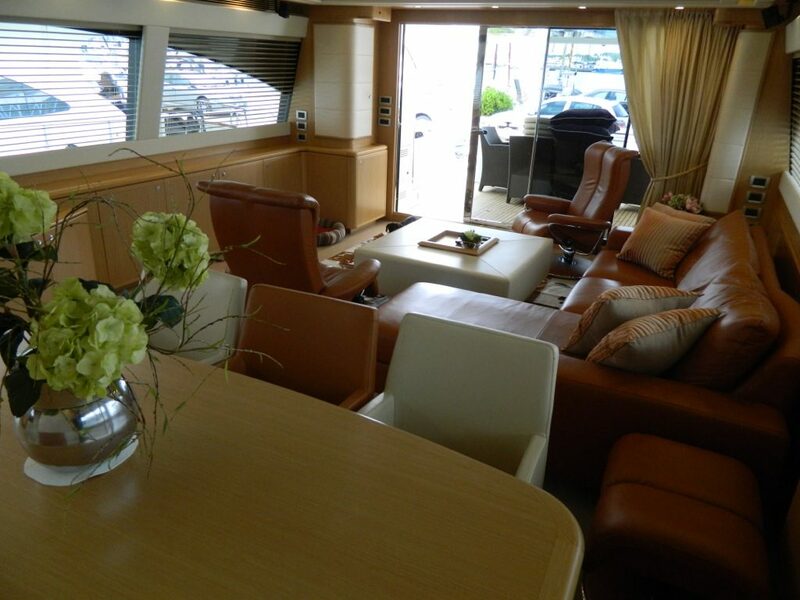 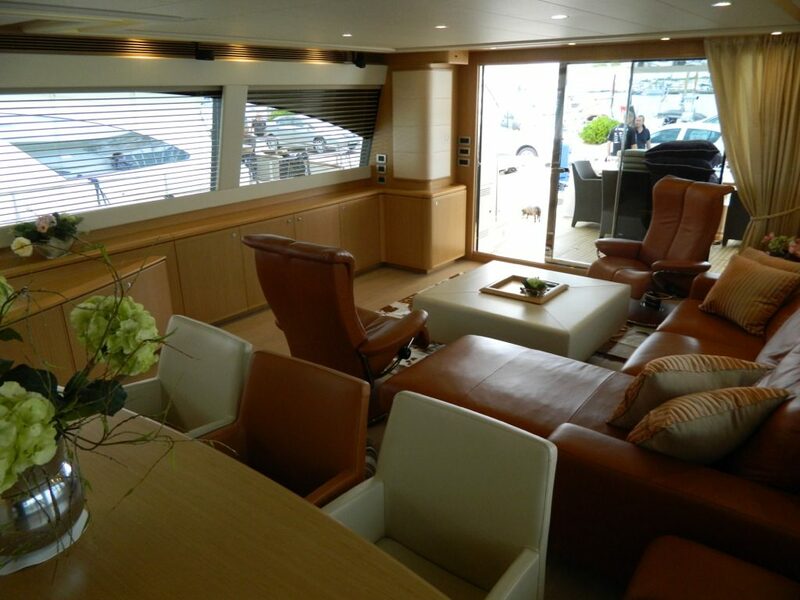 The huge saloon is equipped with all home comforts and hosts plasma screen TV. 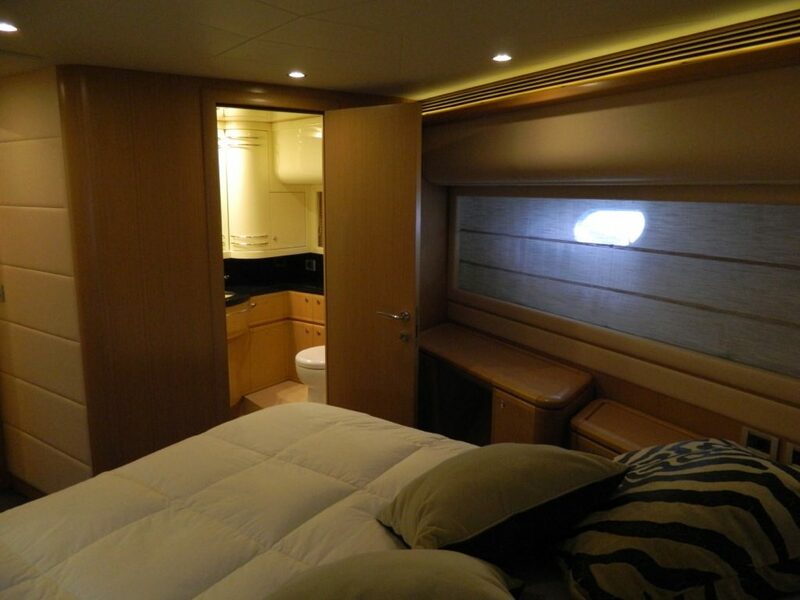 Eight persons can have dinner in absolute comfort. 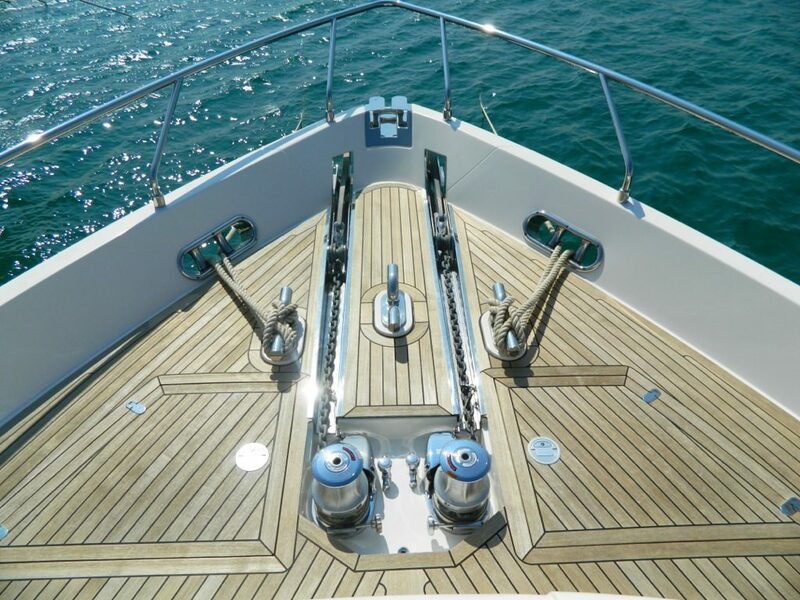 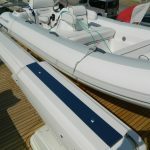 With the 830 the sea really becomes a pleasure without limits. 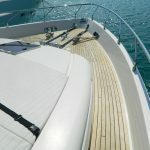 „Do it with passion or let it at all“ In our long year experience our company with its exclusive services grow up to the highest possible standards and we won't accept anything else. 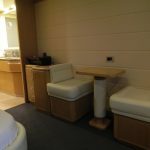 Our challenge are the wishes and the satisfaction of our guests.